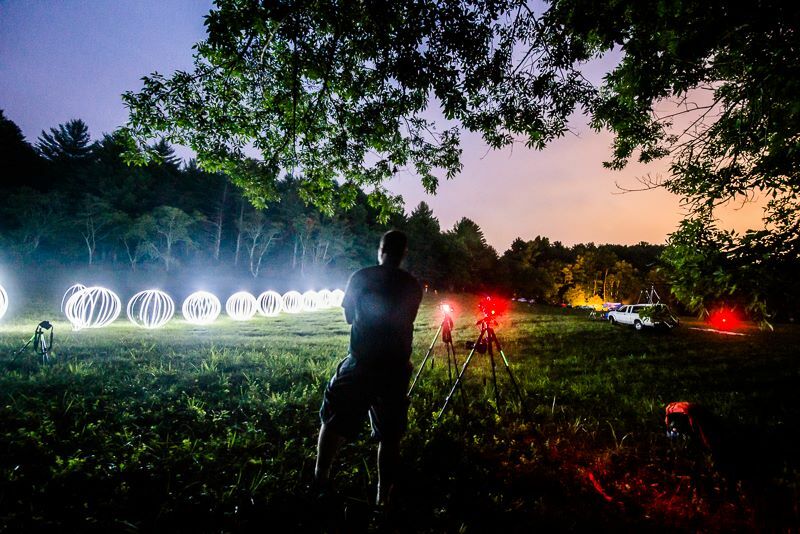 You are here: Home / Search for "200 orbs"
On July 19th 2014, twelve light painters ventured into the Virginia countryside to attempt a World Record. 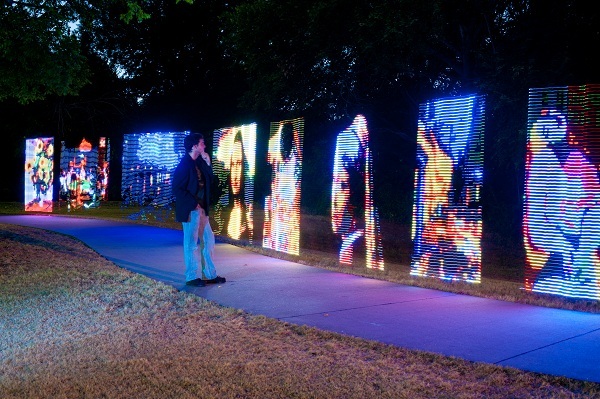 The group collectively called “East Coast Light Painters” consisted of light painting artists from all over the United States. 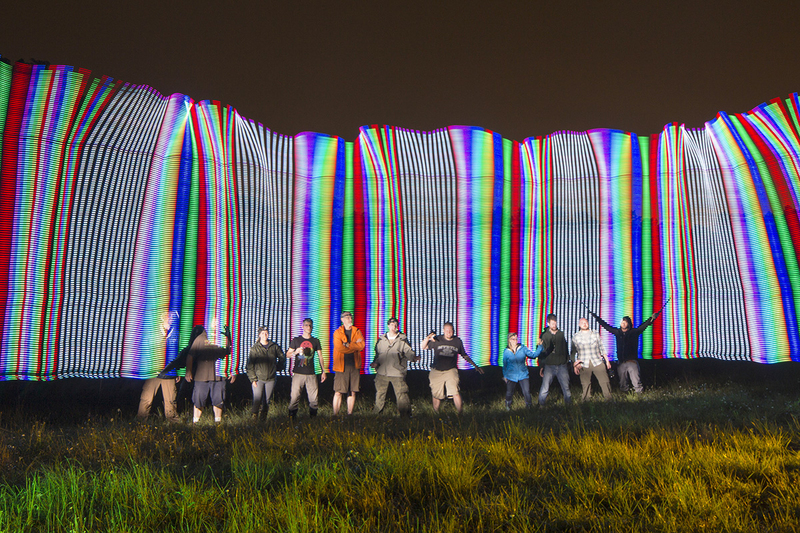 Aaron Bauer, Christopher Renfro, CJ Yunger, Dennis Calvert, Jason D. Page, Jason L. Rinehart, Jeremy Jackson, Johnny A. Andrews, Johnny Dickerson, Laura DelPrato, Mike Newcomer, and Ryan O’Connell all collaborated to achieve the first Light Painting Guinness World Record! 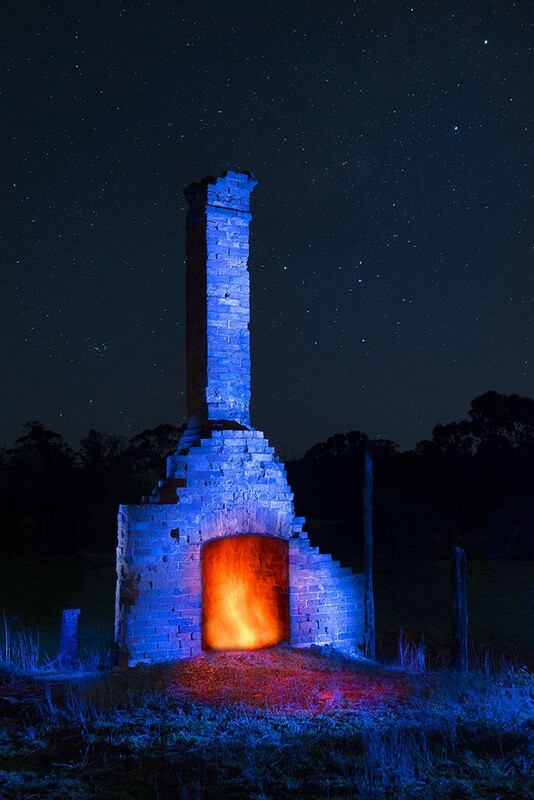 The resulting image represents the true spirit of the light painting artform in uniting people from diverse backgrounds for a creative collaboration. That’s the short story, read on for the details. The first and most important part of this story is that it was a group effort. Setting this record was a massive amount of work, without all of us working together this most certainly would not have happened. January 6th 2014 Light Painter Jason Rinehart (inspired by Andrew Wells “Century Of Light Orbs” Project) put up a post on Facebook asking “Anyone local be interested in calibrating a World Record?” Little did Jason know that post set into motion a series of events that would lead to 12 Light Painting Photographers from all over the United States meeting in a farmers field in the small town of Floyd, Virginia exactly 6 months and 13 days later to set the First Official Light Painting WORLD Record creating 200 Light Orbs is a Single Photograph! The first thing we had to do was pick a date, after some debate July 19th, 2014 was the agreed upon date that the attempt would take place giving everyone plenty of time to schedule flights, get time off from work, and schedule time away from other obligations. Next of the agenda was finding a location. Securing a location that is open, dark, and level enough to create 200 Orbs in a single exposure is not easy. 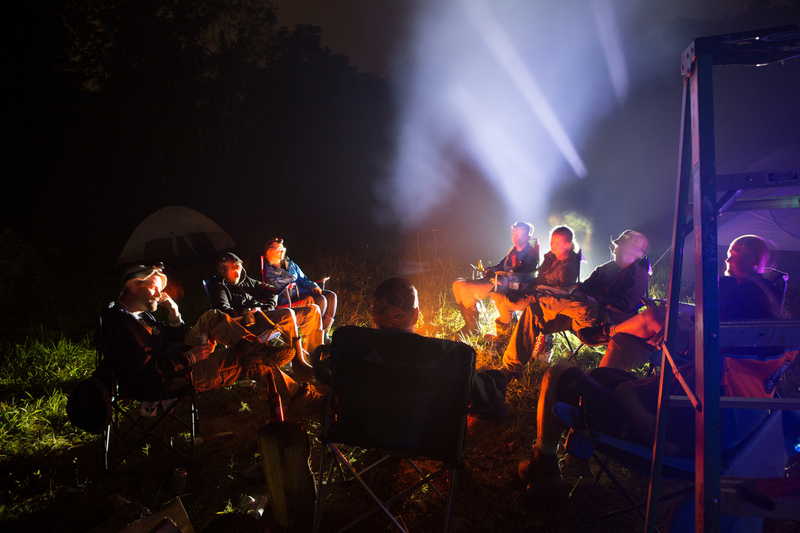 The location also had to allow for a bunch of Light Junkies camping and spinning lights all night long. Many of us were located on the East Coast of the United Stated so Jason Rinehart, Jeremy Jackson and Aaron Bauer searched and searched and found a few suitable places but they all fell through for one reason or another. 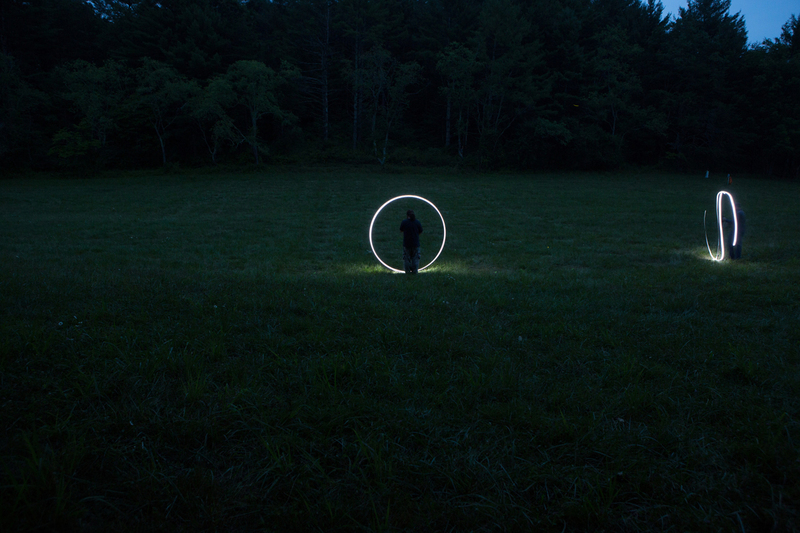 Jeremy Jackson had a friend with a piece of land near his home in Floyd, VA it was a pretty central location for everyone involved so it was finally secured, however the owner understandably didn’t want the event turning into a Light Painting Woodstock so a limit of 12 people was established. 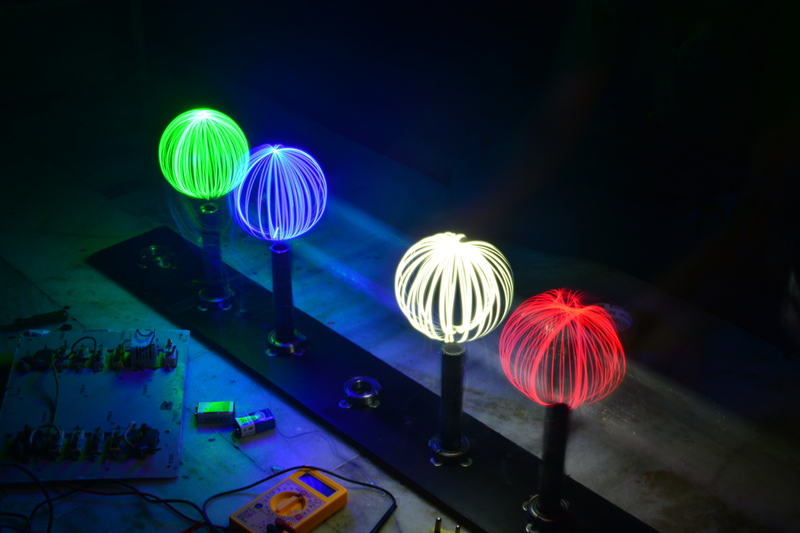 Jeremy Jackson, Christopher Renfro, Jason L. Rinehart and Aaron Bauer worked on building the “Orb Making Devices” that would be used to create the Light Orbs. Many designs were discussed everything from the traditional taped up LED light string to some super complicated mechanical devices. 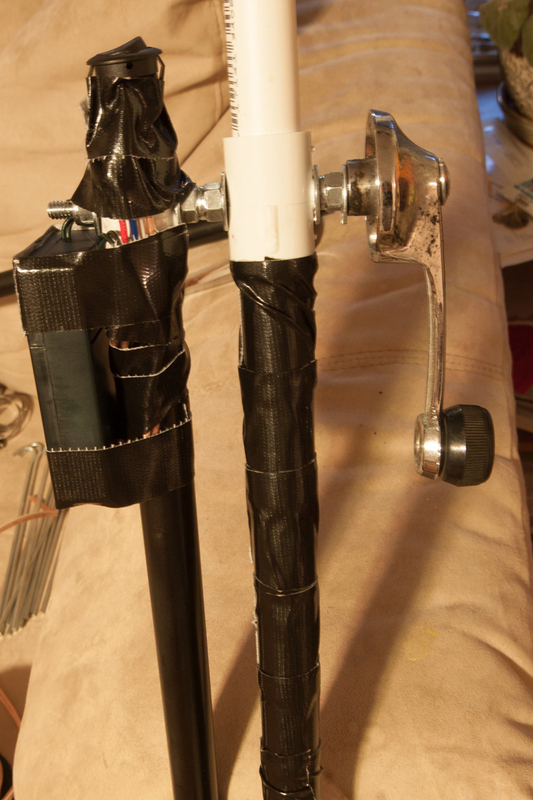 Jeremy and Chris came up with a genius design, The final Orb Maker was a series of metal and PVC pipes with a LED light string on the inside connected to speaker wire on one end, a counter weight on the other end and a old car window crank handle to make the spinning easy with an on/off switch in just the right spot! Hours and hours went into creating 12 Orb Makers and many thanks go out to Jeremy Jackson! Most of us arrived a day early on July, 18th to get everything prepared and to get acquainted. The first day the weather SUCKED it was a dreary day with constant drizzling rain; despite the weather a lot of prep work happened on July 18th. 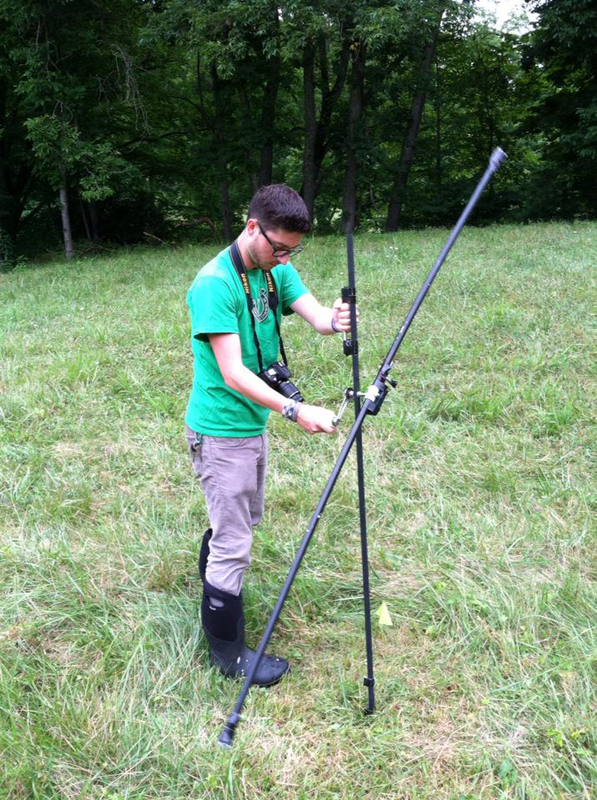 We tested and made final adjustments on the Orb Making Devices, the base camp was set up and the location in the field was selected. That night we gathered together around a fire to come up with a final strategy to accomplish the goal of breaking the World Record! During the daylight hours of July 19th, 2014 thankfully the weather was better with clearer skies. 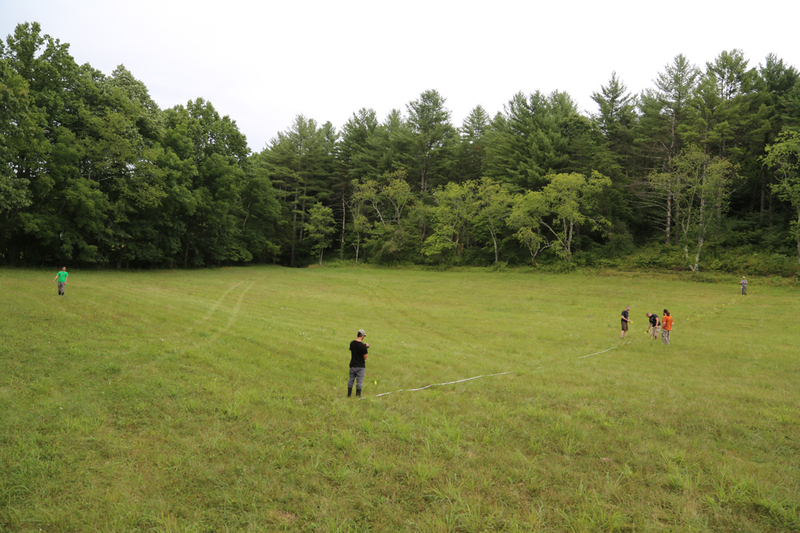 Much preparation was left to do, we marked off the lowest section of flat land in the field in a rectangle shape 80’ wide by 160’ long. 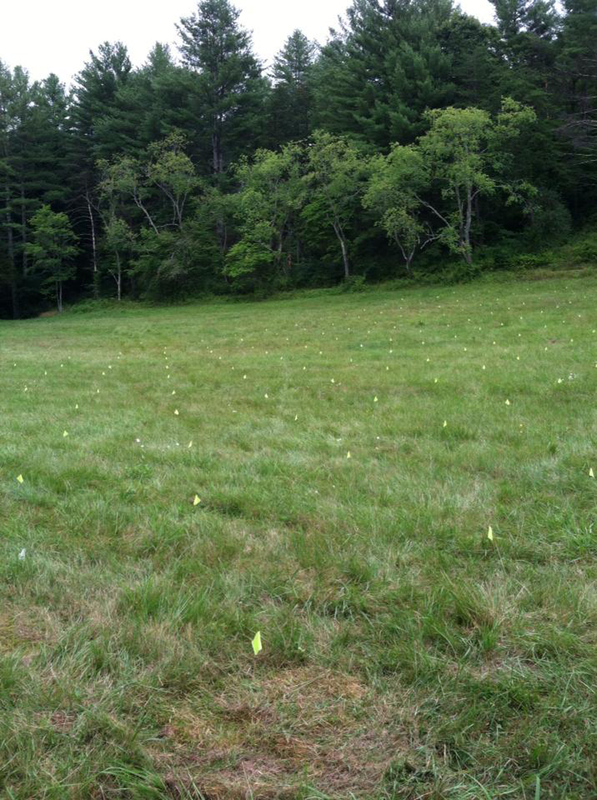 We posted a small yellow flag every 8 feet to mark the center location of the orbs that we would create, the record breaking image was set to be 10 Light Orbs wide by 20 Light Orbs long making a total of 200 Light Orbs in a Single Photograph. The diameter of each of the Light Orbs was approximately 7 feet wide, we allowed for a 1 foot space in between so that the Light Orbs would be easily distinguishable from one another in the final image. 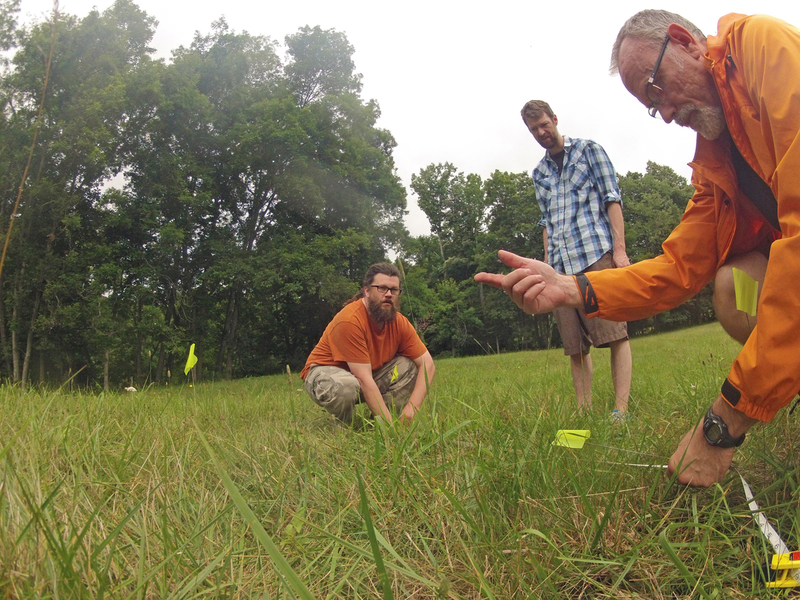 The grass in the field was really high so Jeremy and Jason used weedeaters to mow the field around EACH of the 200 flags in a circular pattern to allow the Orb Making Devices to spin freely. Other than the grass and the weather, another challenge was to find an angle high enough that would allow for all of the Light Orbs to be seen by the camera, to accomplish this there were a few different strategies. 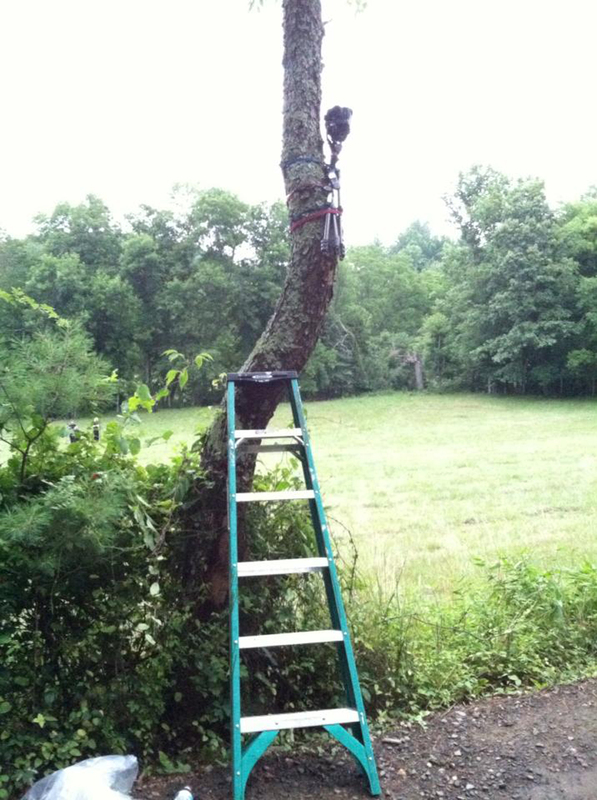 Jason Rinehart used a ladder and climbed high into a tree to find his angle. 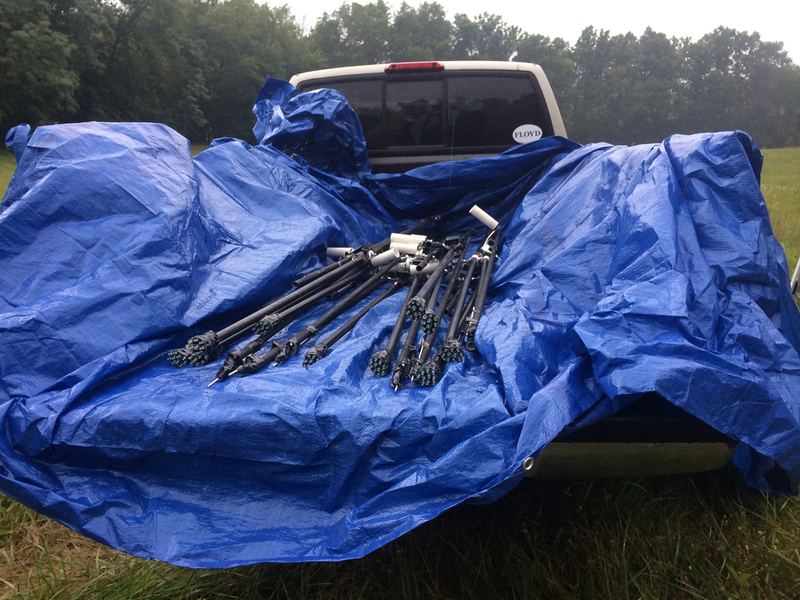 Myself (Jason D. Page), Aaron Bauer, and Jeremy Jackson climbed to the tops of our trucks and extended our tripods as high as they would go so that they would be able to get an angle that would allow the camera to see all of the Light Orbs created. Everyone else moved around the field to find the angles they thought would look best. As the sun started to go down and the light faded we took test shots to see how long the exposures could run with the amount of ambient light that was in the area. It was a very dark and desolate location, there was no moonlight and very little light pollution so the exposures could go for 30 minutes or more if needed without being over exposed. While some of us took test exposures others worked with their Orb Making Devices to make sure everything was working properly and they had the feel of how to make an orb with this new tool that many had never used before. Just after the last bits of sunlight faded everyone was in place to break the record all lights were turned off and everyone’s camera shutters were opened. Dressed all in black the first victim, Aaron Bauer, walked into the scene, stood on the first marked location, illuminated his Orb Making Device and created the first Light Orb by standing on the marked location, spinning the hand crank in a circular motion, while rotating his body 360 degrees to create the Light Orb. After the first orb was created Aaron then moved to the next marked location a row ahead as another light painter came in and repeated the same process on the marked location one row across. 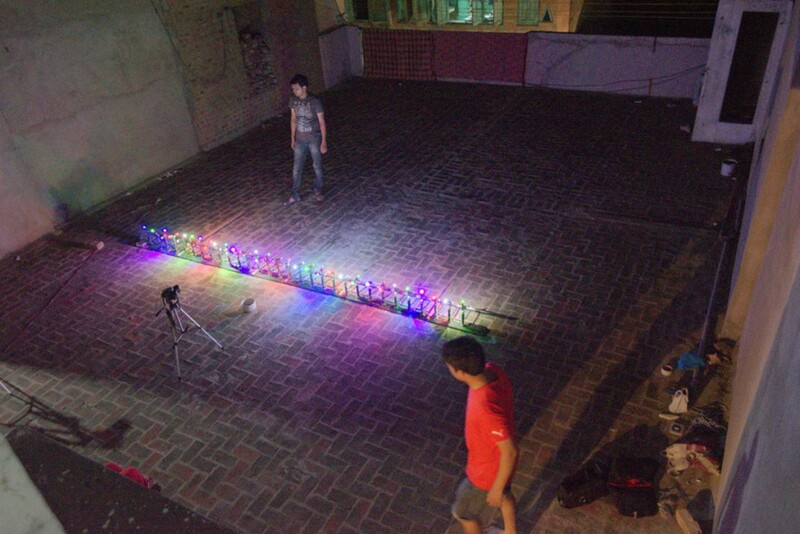 We created the Light Orbs in staggered positions so that we would not block each others light from the camera’s view. Once all of the Light Orbs were created the shutters of the camera’s were closed and the 200 Light Orbs were captured in a single photograph. We decided to create the image a second time, this time using handheld flashlights to illuminate the scene and some of the trees in the background. 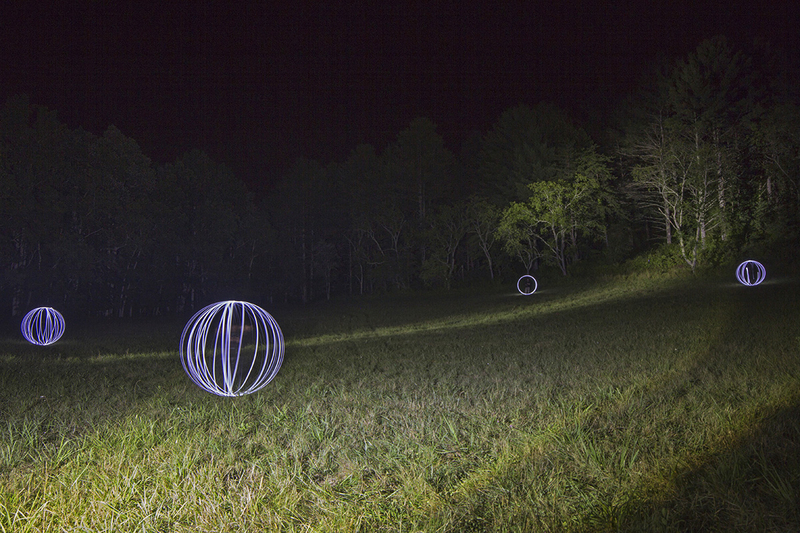 During both exposures we successfully created 200 Light Orbs in a Single Exposure! 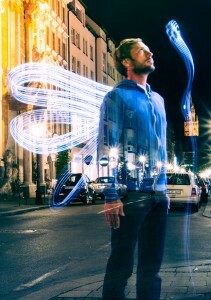 Each light painter had slightly different settings on their shots but the “Official” image for the Guinness World record was a 1651 second exposure, at F8, and ISO100. 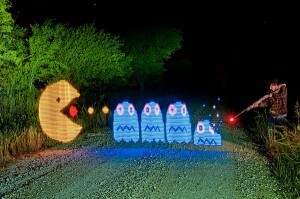 We decided to break this world record because we are all extremely passionate about the light painting art form. 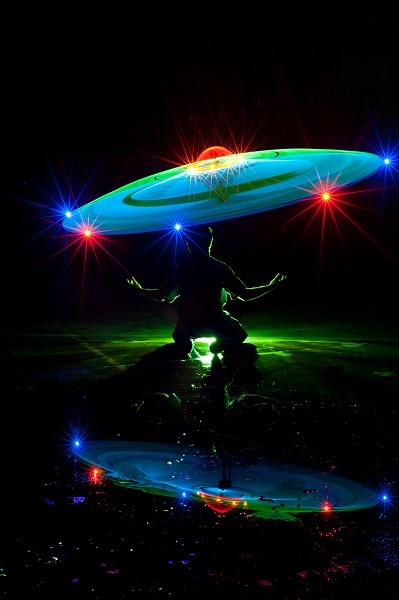 The hope of this project is that by having a record in the Guinness Book of World Records we will gain more exposure and introduce more people to the light painting art form. It was also a great reason for all of us to meet for the first time in person and work together collaborating on a project to progress Light Painting. Besides that it was F@#$! *% FUN. A HUGE THANK YOU to our Guinness World Record Witnesses Jon Beard and Nicole Pradas! 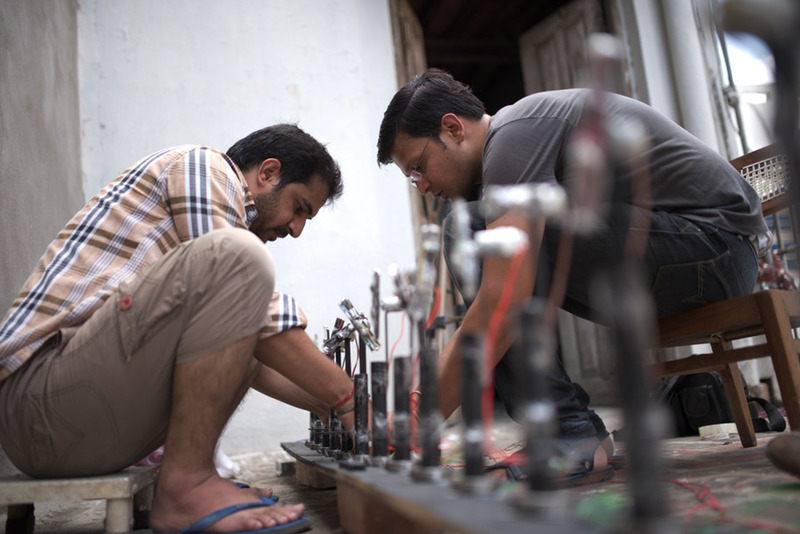 Two Light Painters from India have broke the “Most Light Orbs in a Photograph” Guinness World Record. 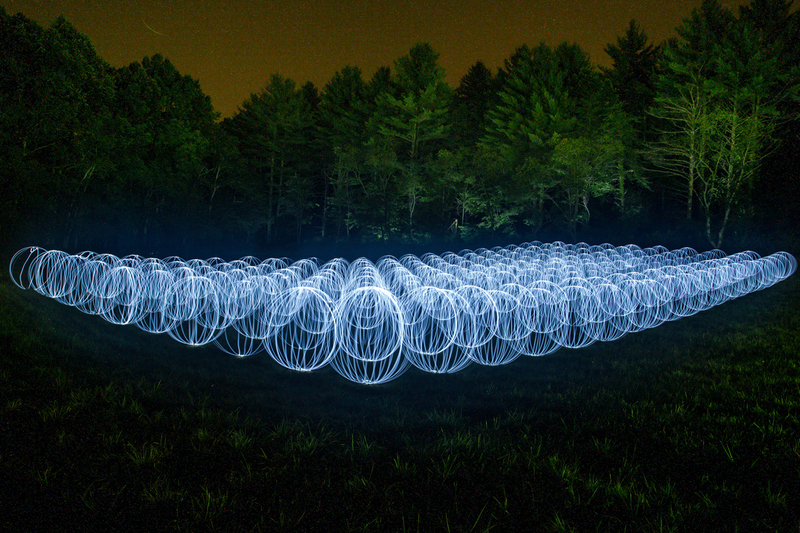 Sridhar Muthukrishnan and Sures Narayanan have captured 1350 Orbs in a single photograph. This is the 3rd time the record has been broke since the original 200 Hand Spun Orb record that was set back in 2014. 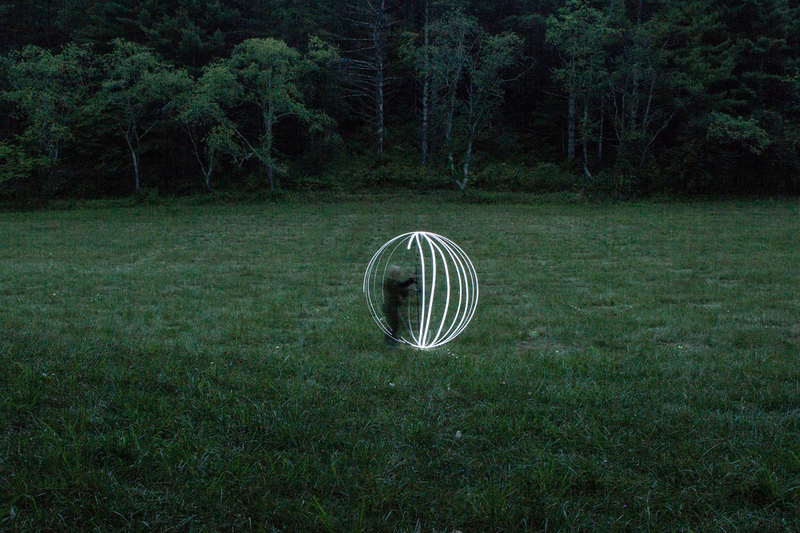 The orbs in this image were created using a mechanical orb making device that was pulled across the frame during a single long exposure. Congratulations to these two for setting the bar even higher, WHO’S GONNA BREAK IT NEXT? Below is the making of video, Enjoy. 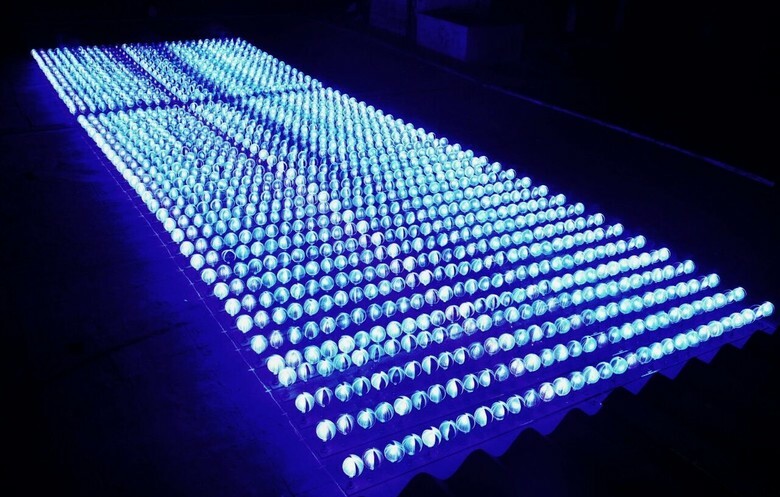 New Light Painting Guinness World Record, 1000 Orbs! 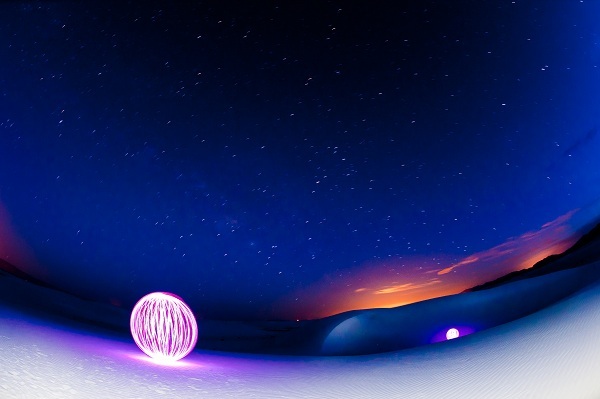 The quest to create the most light painted orbs in a single exposure all started with Andrew Wells and his Century of Light Orbs Project, in which Andrew single handedly created 100 light painted orbs in a single exposure! Then the East Coast Light Painters, (myself included) broke Andrew’s record and got the first “Official” light painting world record by creating 200 orbs in a single exposure. 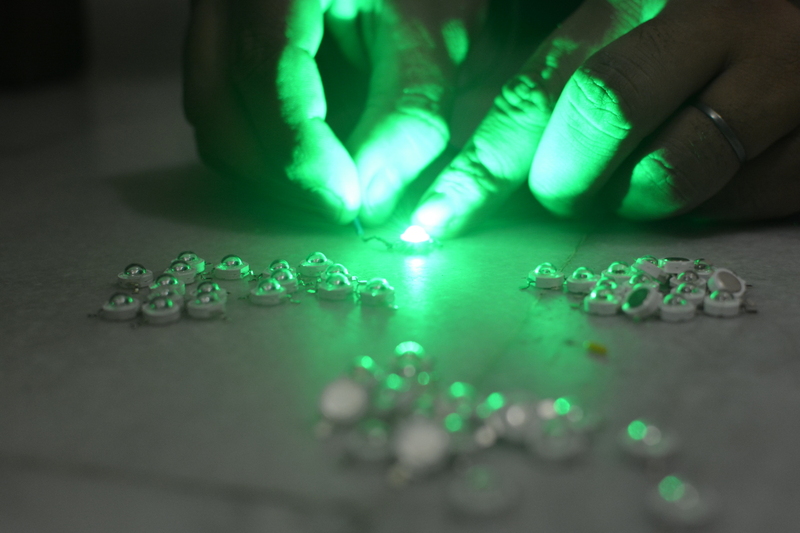 Then a team from India took a completely different approach to creating the orbs and blew the record away by creating 900 mini light painted orbs in a single exposure. 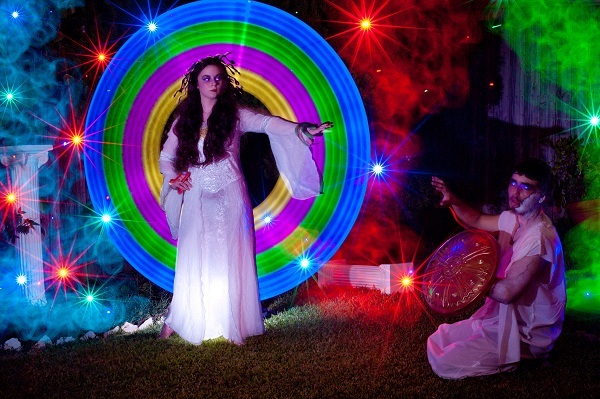 Now that record has officially been broken with 1000 Light Painted Orbs is a Single Exposure! What is even more wild is that they were all created by hand! 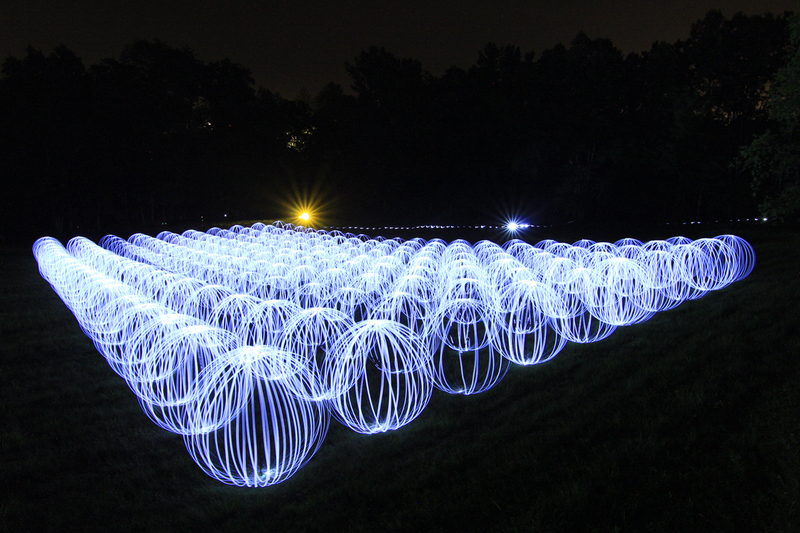 20 participants under the direction of Wolfgang Laich and Michael Walch have created ONE THOUSAND handcrafted light painted orbs in a single exposure! Check out the full interview with Wolfgang below for all the info on how they created this record setting image! Hi Wolfgang congratulations on breaking the Guinness World Record for the most Light Painted Orb in a single image, 1000 Orbs is a one hell of a lot of Orbs! Can you tell me who was involved in setting this new Guinness World Record! Well it was my friend Michael Walch and me (Wolfgang Laich) as the photographers. We, along with 18 friends and 3 independent referees took part in the attempt. 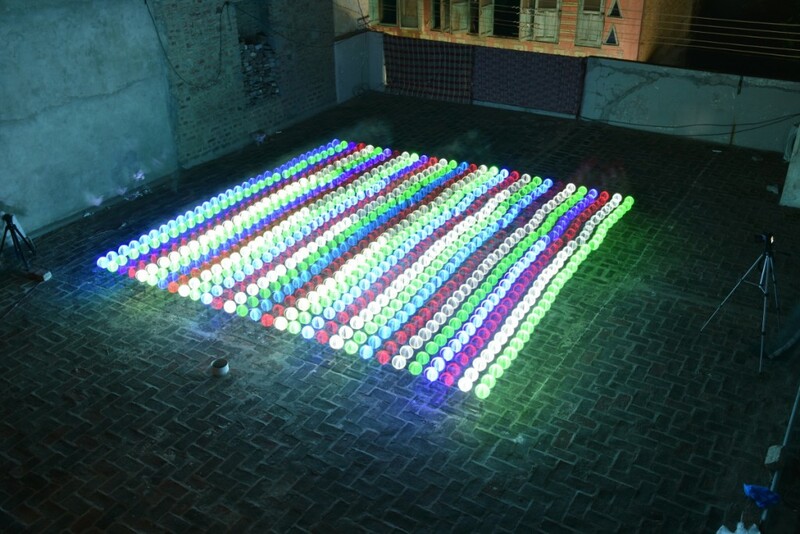 A total of 20 people worked to build the light orbs in the final picture. You had mentioned that you have not been light painting that long, how did you start light painting and how long have you been creating your images? 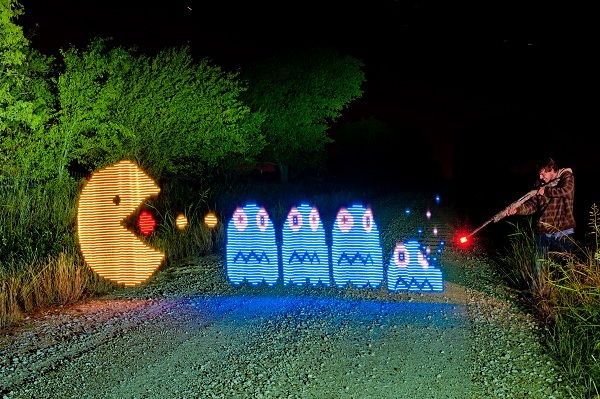 We started light painting about 2 years ago in the winter time. 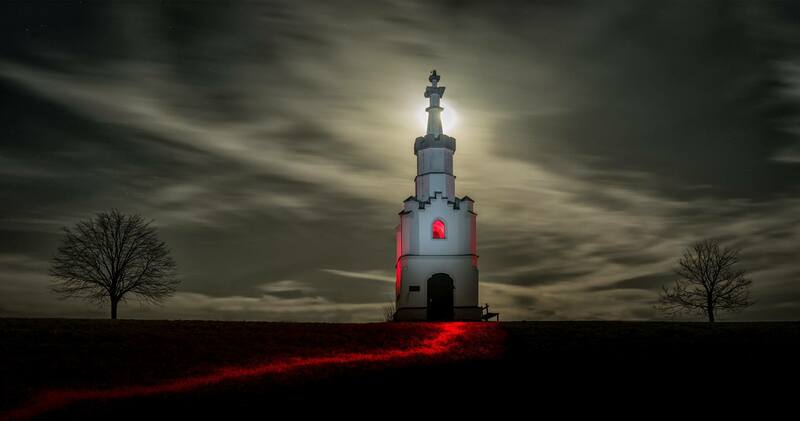 It gets dark early here (Kempten/Allgäu Germany) so we use the time for taking pictures. Mainly we try to tell a story with our pictures! 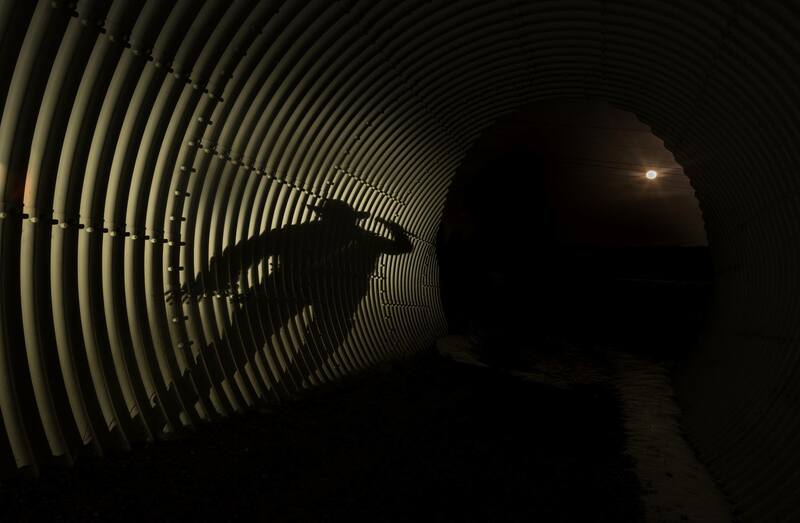 First we made pictures with burglers in the dark night, movements and shadow, Fire balls…. then coloured shiny dead persons… we used more and more self made tools and also Light Painting Brushes. What inspired you to set out to break the record? We found some pictures on the Guinness website from the former Record holders. The first record the Orbs were all made with a lot of handcrafted tools. Then the last record from the Indian team the orbs were made by little electric “game balls”. We wanted beat them with good old handcrafted orbs 😉 ! Can you tell me a little about the process, what was involved in the planning of the record attempt. How long did all the preparations take? Normally in winter times after work it gets dark very early and there are no cows and fences in the fields 🙂 The farmers keep them away because of the snow. It is cold outside but that is the time when we have enough space, no people and time for some attempts. We worked for about two months (we built all the tools ourselves) with preparing, improving, testing and keeping the costs low, we needed for 2 months for all the preparations. 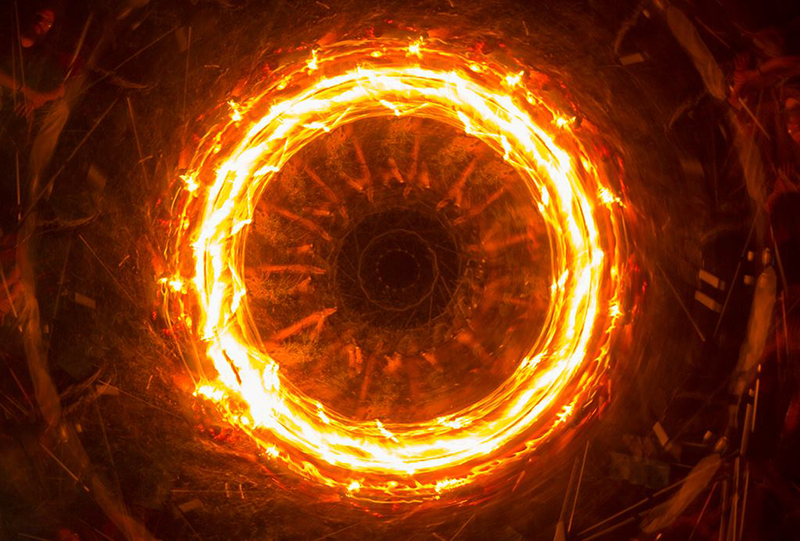 How did you create the orbs, did you make them by spinning them by hand or did you have a special tool? We moved them by hand but in special way. We tried a lot of different possibilities, we made pictures and analysed the results afterwards. At the end after a lot of tries we decided that the best solution was to create the orbs using a tools with lights on both sides so a full orb would be created in a half rotation. 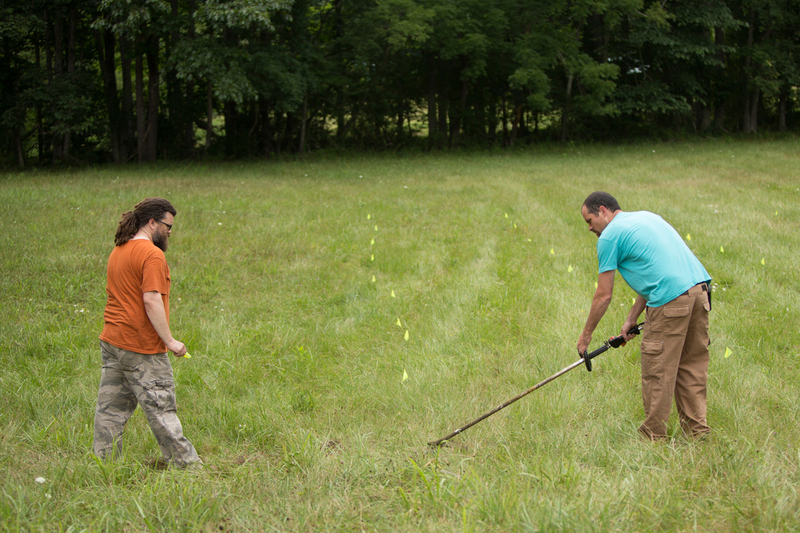 We had everything marked out with rows. We fixed three lines on the ground, one line in the middle of the field, one line marked the far right side and one line marked the far left side of the frame. On every string we fixed a little piece of wood every two meters on the rope. 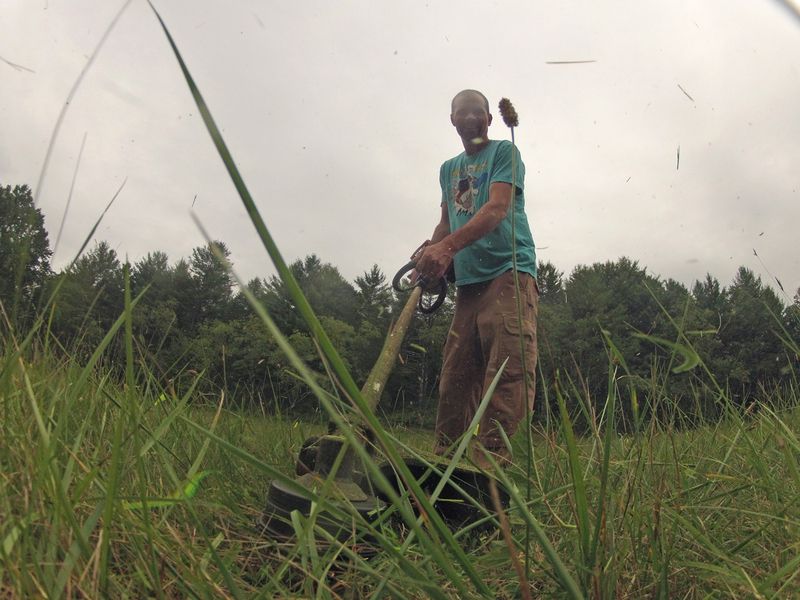 Three people were able to move back on the lying rope to the next little part of wood that marked the next location. I took my place in the middle row on the line to give the instructions with my own voice. Every movement was coreographed, even how we created each individual orb in the row was by directions. Each of the 20 participants took their place in the row and then I gave the directions. To create each orb I gave the instructions “Lights on, half rotation, stop. Move to two o’clock, half rotation, stop. Move to three o’clock, half rotation, stop. Move to 5 o’clock…….. Think of it like standing on a watch face this was the easiest way to communicate where to turn the lights on and off for participants that had not done this before. To create each orb we had 8 half movements. Then turn lights out!! 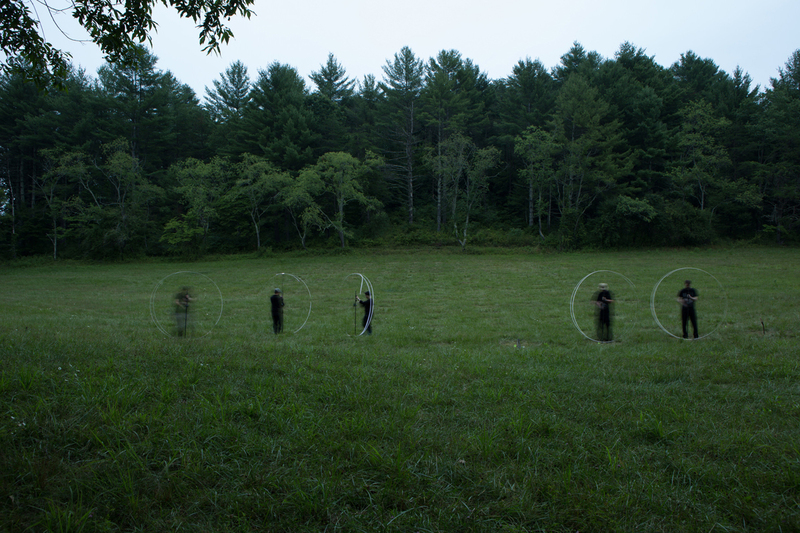 Once we had a full row of orbs created the group moved one point back on the line. 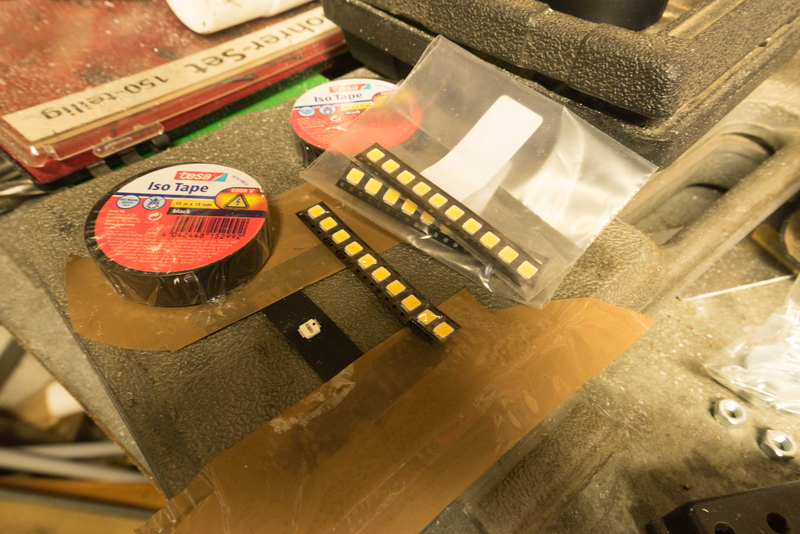 Then lights on and we repeated the same process with instructions all over again. How big are each of the orbs? 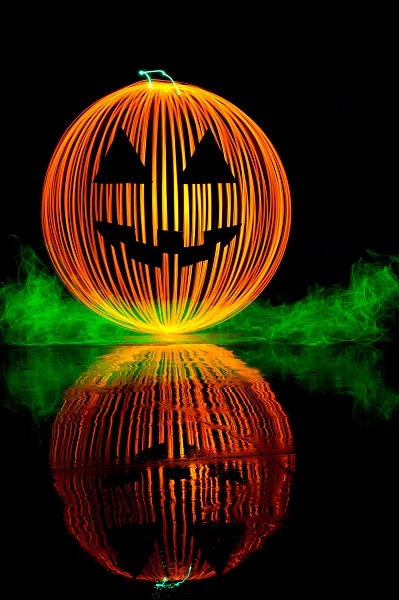 Each of the orbs was approxamately 1.5 meters. Why did you decide to create the orbs using this technique? We chose this technique because it was the easiest for our friends to learn quickly. We wanted to create the image with a group. We only showed the participants how to create the orbs one time and only minutes before we set the new world record! Did you achieve the image on your first exposure or did you have several attempts? It was the first and only attempt we had. The weather was very cold and some participant weren’t be able to do it a second time. With really cold fingers it was even difficult to use the on/off button..
How long is the exposure for the winning image? It was a 3149 second exposure. What was the most difficult part of creating 1000 orbs in a single exposure? Maintaining the proper distance between all the participants was the most difficult part. The problem was because of the optic lens with an 18mm lens. In front line you had ~40m and after 110 meter you need at least 55 meter. When our friend goes back to the next point after the “turn off” the light command the distance between the participants had to became little more….. And we didn’t use more lines… Michael always checked that the participants had the right distance to their neighbor before the lights were turned back on. That sometimes was not easy, but we all had a lot of fun with it!!! Then second problem was making all the orbs countable!! We needed long ladder (5 Meter) to get an angle high enough for taking the picture. And last…. also because of the lens. 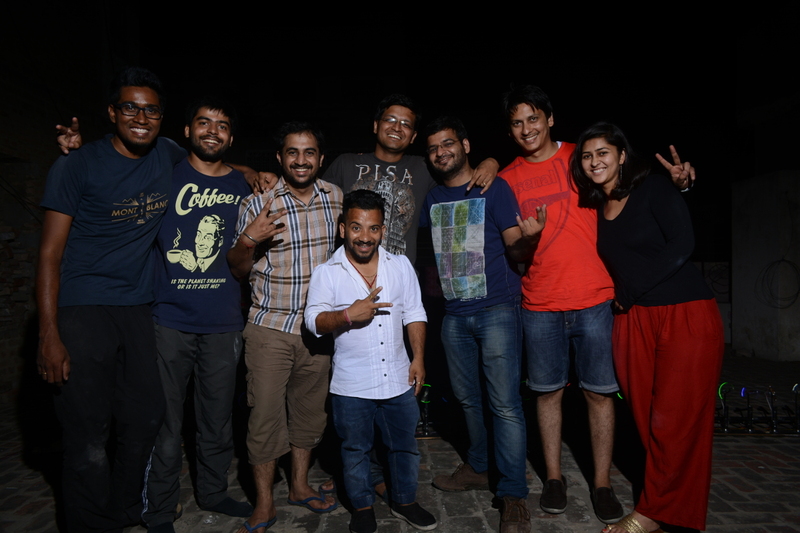 We started with 12 people for 5 rows so that we didn’t lose too much of the best countable space in front of the camera. 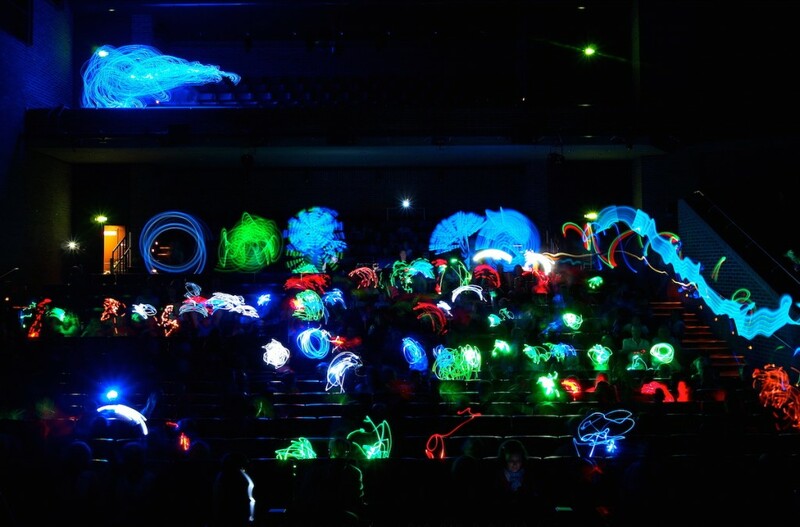 Do you have plans to set any more light painting world records? Good question, we normally never do the same thing two times. We will be happy to congratulate the next winners that will beat us! Different challenge maybe, we will do more light painting for sure!! After we got that nice response from you and JanLeonardo yes we try more and hope to improve but never want to copy! Thank you very much for taking the time to share some great info on how you accomplished this excellent record, 1000 orbs by hand is just amazing! Great work and thanks again! Thank you very much Jason and we are really proud that you found and show your interest!!! To check out more work from Wolfgang and Michael you can check out Wolfgang’s Flickr page HERE. LPP ∇ Hi Peter I am really enjoying with your new Group Light Paintings in Public Spaces but before we get into that can you tell me a little more about yourself, specifically your background with photography and Light Painting? PS ∇ I bought my first serious camera as a 16 year-old schoolboy way back in 1974. It was a Nikonos II underwater camera and I used to swim out at popular surfing locations and shoot from the water. Surfing photography was a good teacher. I learnt that getting a good surfing image took a lot of planning, travelling, determination and good luck. At one stage I began to experiment with shooting surfers at night. I attached a waterproof flashgun to my Nikonos II and set up night surfing sessions with local surfers. It was a crazy thing to be doing, floating around in a dark ocean being smashed by inky-black waves, but the reward for such extreme photo sessions was capturing something completely different from your everyday photo (not unlike the pleasure I get when doing my light paintings today). The results of my night surfing photos were finally published in 1977. 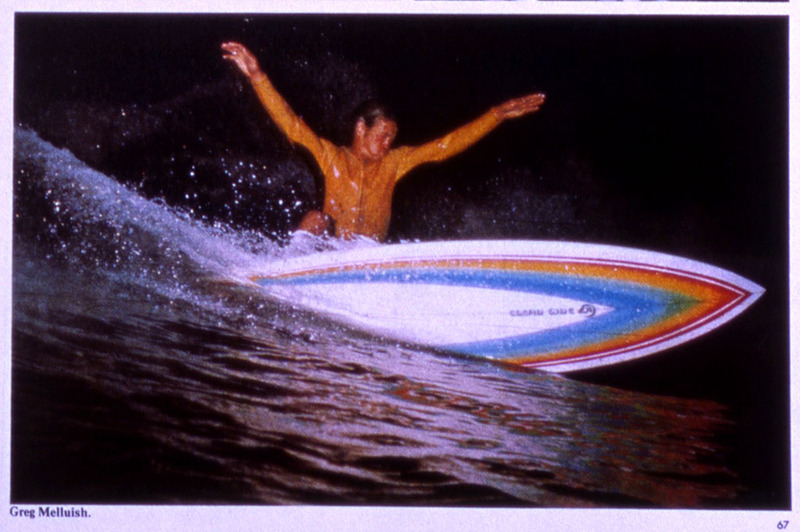 It was the first ever feature article about night surfing and there was a real fascination about the photos at the time. From 1980 to about 2005 I followed my dream of working as a photojournalist. I shot assignments for many magazine, newspaper and corporate annual reports both in Australia and internationally. It was a great experience. During this time I had a number of opportunities to experiment with long exposure photography and light painting techniques. For example in 1980 I worked at an underground mine in outback Australia. A photographer there showed me how to light-up huge black spaces where ore had been extracted during the mining process. 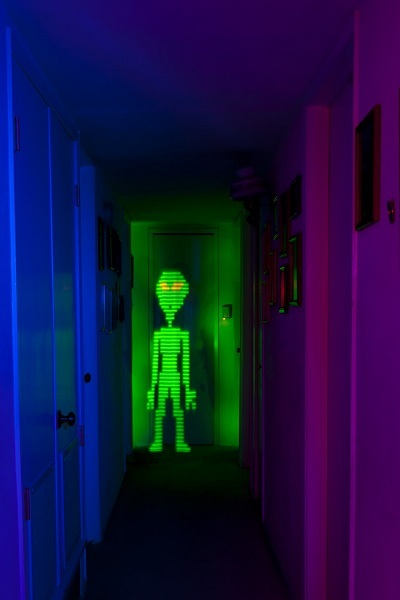 He would walk around with a Metz 60 flashgun and light paint these pitch-black chambers using up to 50 separate flashes during a long exposure. The result of all that accumulated exposure made the space look as bright as daytime. I began using that technique on numerous industrial photography assignments over the years. Around 2005 I noticed things were really starting to change in the photography business. I realised my livelihood as a photojournalist was coming to an end, as newspapers and magazines started cutting back on budgets and sacking staff photographers. I was frustrated that I had so many skills but was not able to use them anymore. 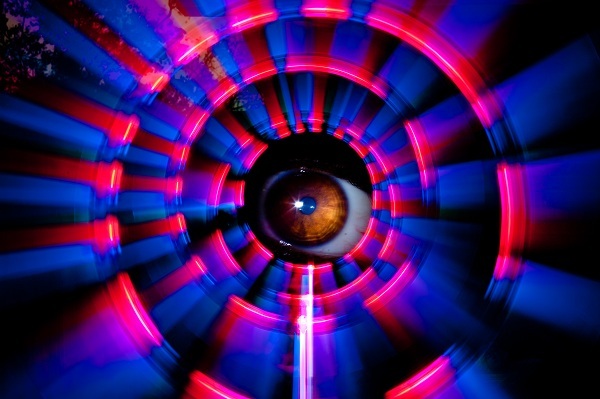 I was in my mid 40’s and I wanted to keep doing interesting photography so I started to dabble more in light painting. I began using a mini-Maglite to draw outlines of historic Aboriginal engraving sites carved into sandstone rocks near where I live in Sydney. I realised that light painting made it possible to reinterpret a place in a very particular and unique way. 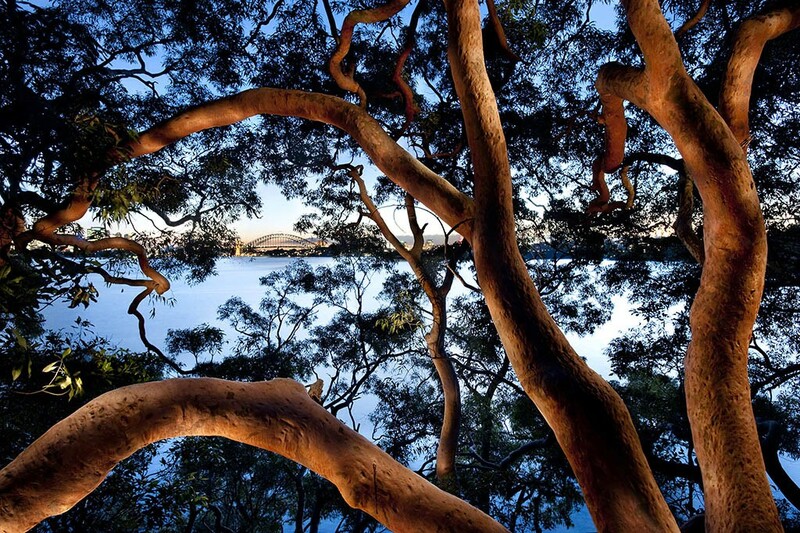 In 2009 I then started applying torchlight to trees and rocks and sought to create mysteriously beautiful images of the Australian landscape by blending torchlight with ambient moonlight. From this series I began to build a new website called Illuminated Landscape www.illuminated-landscape.com which has been very successful. The photos from the Illuminated Landscape series sold well as fine art prints to both private and public collectors and I won several prestigious landscape photography awards. 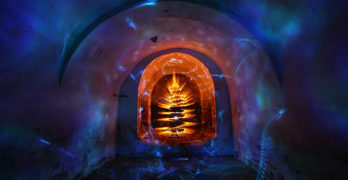 Through this period I also began to run light-painting workshops. I have since taught hundreds of photographers the art of light painting and it has been a thrill to inspire so many people. 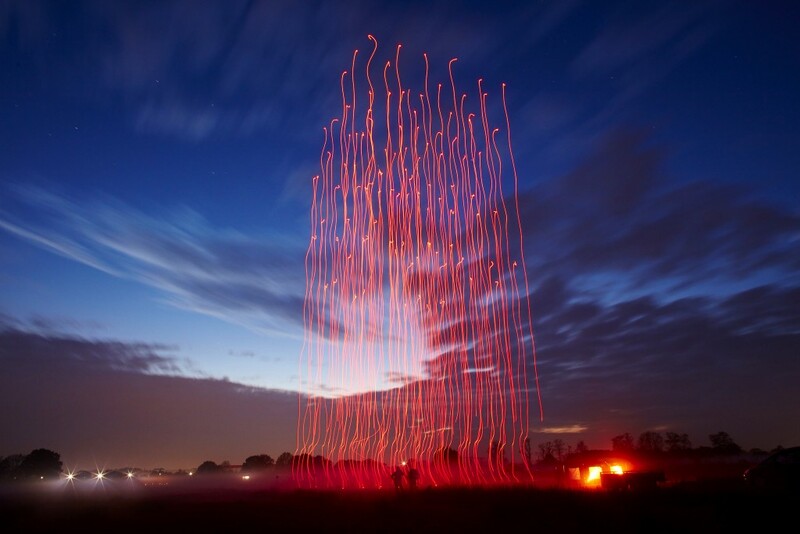 LPP ∇ The group light paintings that you have been creating are absolutely incredible, was the ‘Field or Orbs’ your first Group Light Painting? 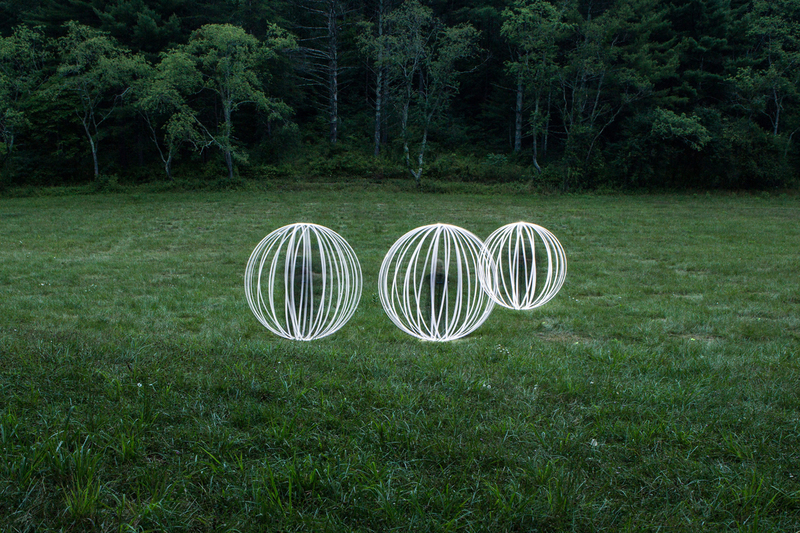 PS ∇ The ‘Field of Orbs’ wasn’t my first group light painting event, but it has been my most ambitious and successful. 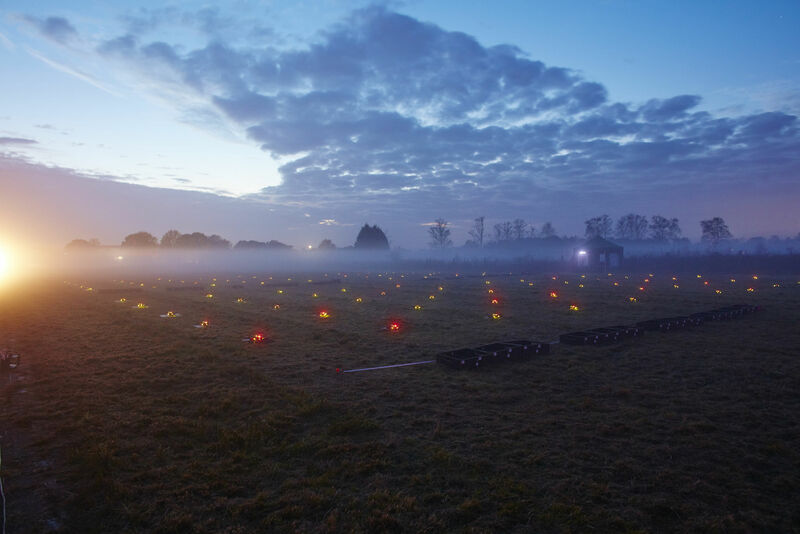 The Field of Orbs was very special as I conceived the idea from the start and kept total control over how it should be created and what sort of outcomes I wanted to achieve. It is very thrilling to see something that existed in your imagination come to life so publicly and with such energy and enthusiasm. 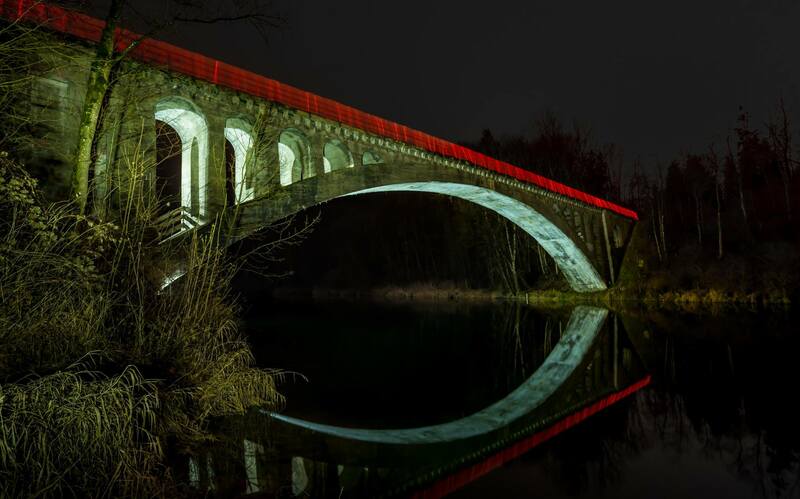 It also allowed me to set a new benchmark for the way light painting can be used for public enjoyment. 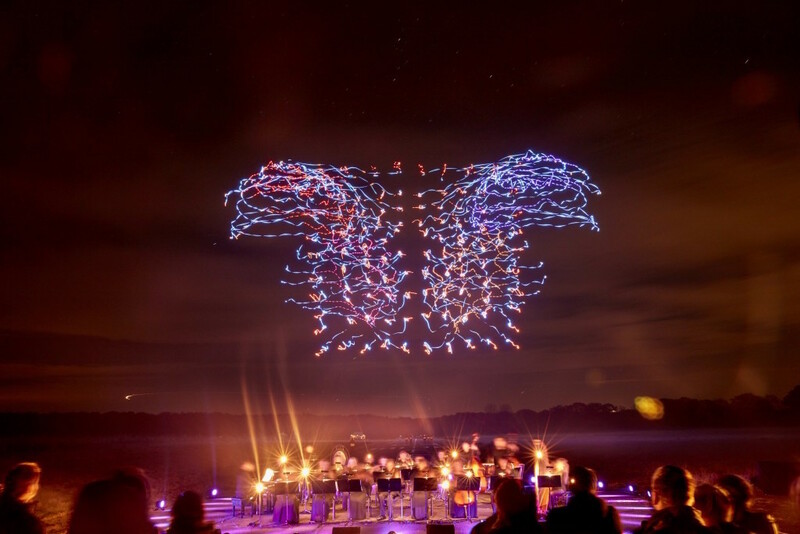 I especially want to acknowledge the amazing orb images of the East Coast Light Painters and Andrew Wells whose work provided the original inspiration for this event. 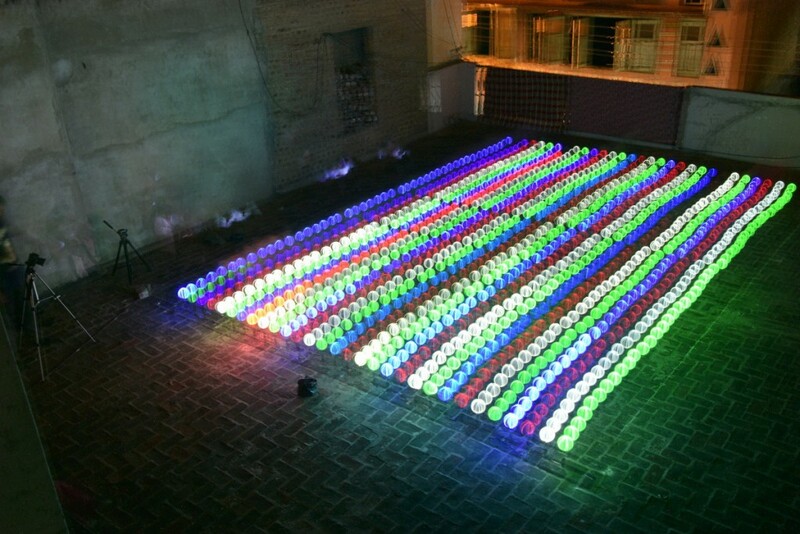 Previously in 2009 I did a large-scale light painted image as a global environmental art project to promote the 350.org climate change movement. I directed 150 people holding glowing lanterns to walk around a marked pathway over a 45 second exposure period to create the number 350. 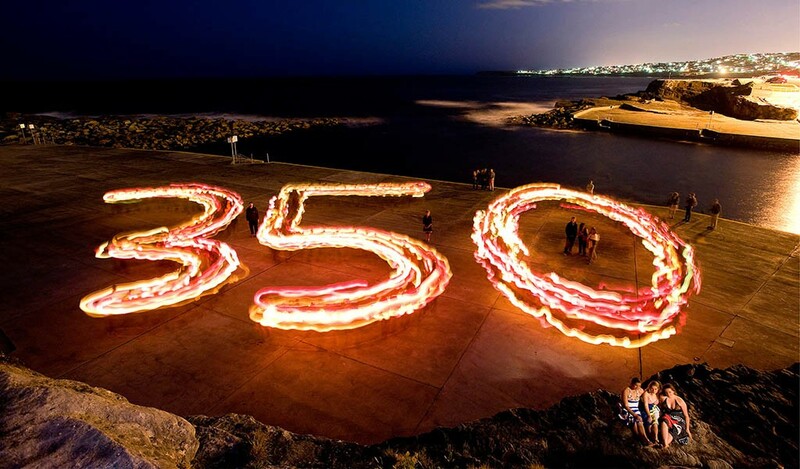 The image was very successful and is still used as a key graphic on the 350.org home page seven years later. LPP ∇ Were the participants of the Field of Orbs project part of a photography club or something like that or were they just random people interested in making art? 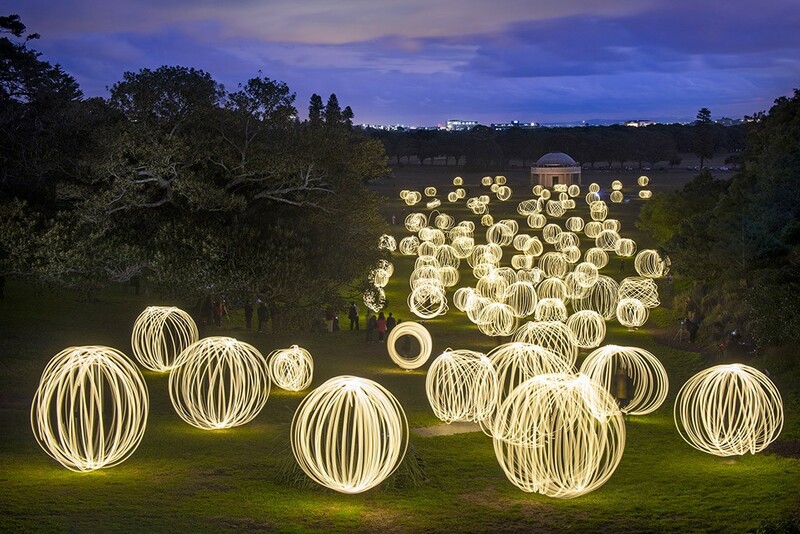 PS ∇ The Field of Orbs was created to celebrate the International Year of Light and I received support from government agencies wanting to get the general public involved in the celebrations. I realised that having 100 volunteers spinning orbs would be a great way to get people from all sorts of backgrounds excited about creating public art and experiencing the magic of light painting. So we listed the event with an online booking agency called Eventbrite and within days the event was fully subscribed. The organizers actually had to stop promoting the event, as they were worried about the crowd becoming too big to handle. LPP ∇ Woah, so how many people were involved? 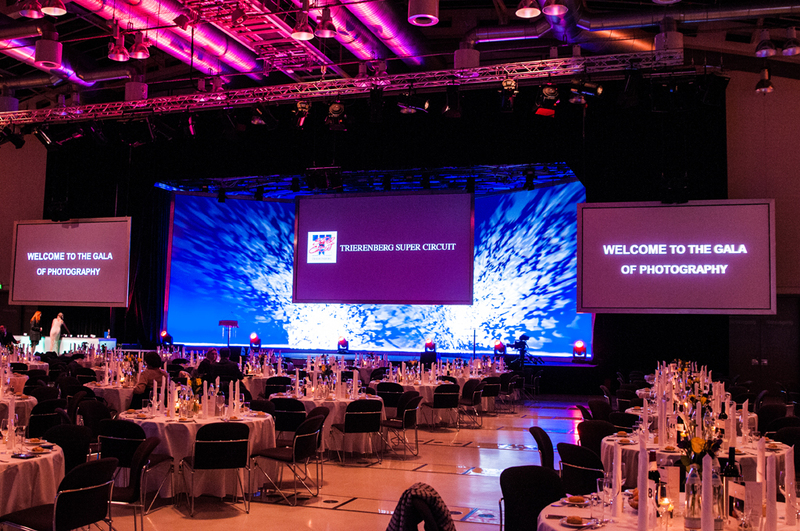 PS ∇ In the end we had 100 orb spinners, 200 photographers and around another 200 spectators. I think a lot of the photographers came from Meetup website groups and camera clubs who had read about the event in the promotional publicity and realised that it would be a unique event to photograph. LPP ∇ How did you get that many people to participate let alone actually understand what they were doing? PS ∇ As this was a public art event I was very interested in the public participation aspects of the event, rather than just getting a great photo, so I decided not to get too fussy about everyone doing a perfect orb. I knew from my previous workshop experiences that orbs always look great in photos anyway and I imagined 100 of them spread across a valley would look awesome, even if they were not as perfect as I would have hoped. Indeed there were a lot of very clumsy orb spinners on the night, but I made sure I arranged some of the neatest orb spinners to stand up in the foreground to help ensure the photo’s success. LPP ∇ How long did it take to put this project together? PS ∇ Fortunately I had about 5 months lead time, which meant I had ample time to make up the lights and trial them before the date. 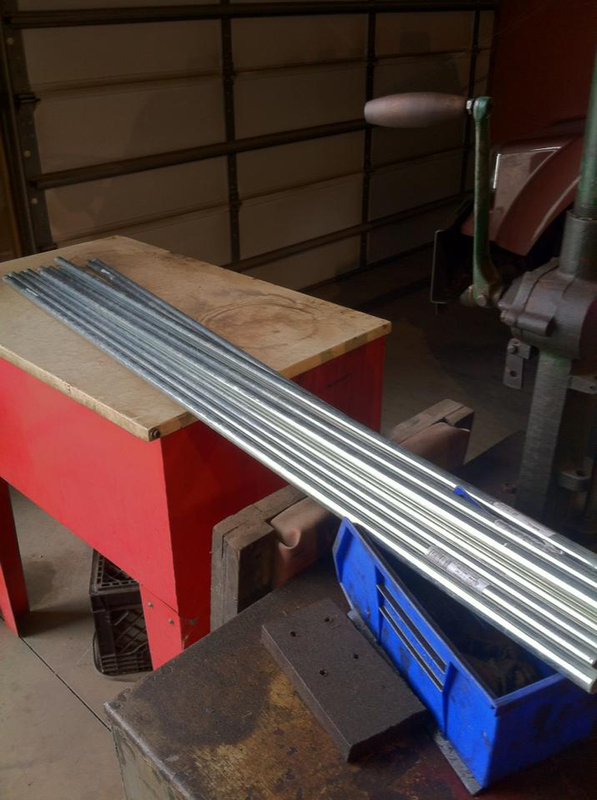 I made every light by hand, which was a slow process. 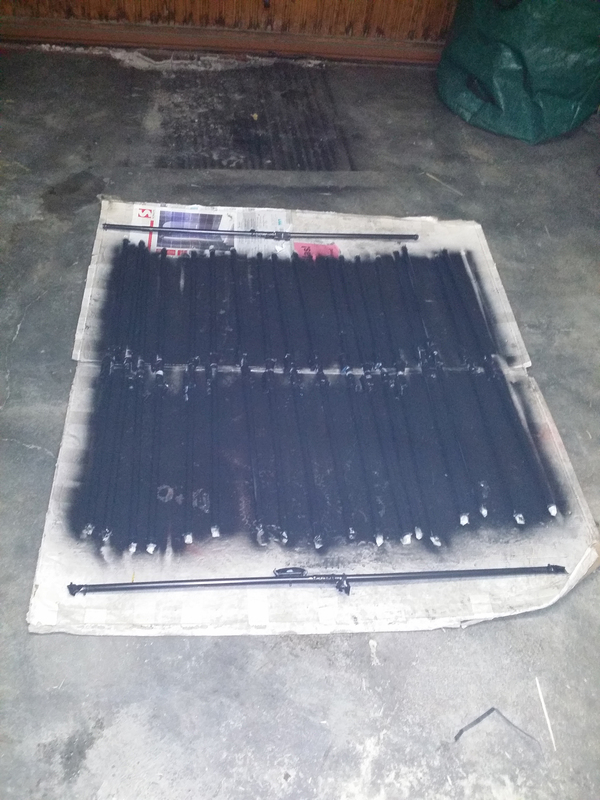 LPP ∇ You created several group light painting images were they all done on the same night, or over a few nights? PS ∇ Yes I used the opportunity to try other light painted images on the night that I thought might look good. One was the Ring of Fire where I got my 100 ‘orbsters’ to circumambulate a wonderful domed building in the park called the Federation Pavilion. There was an interesting atmosphere in the crowd as they did this. People started to sing and speak to each other expressing a real sense of togetherness. It was like a spontaneous ceremony. I also tried an idea I called the River of Light where I got the 100 orbsters to wind their way slowly up the valley like a river. 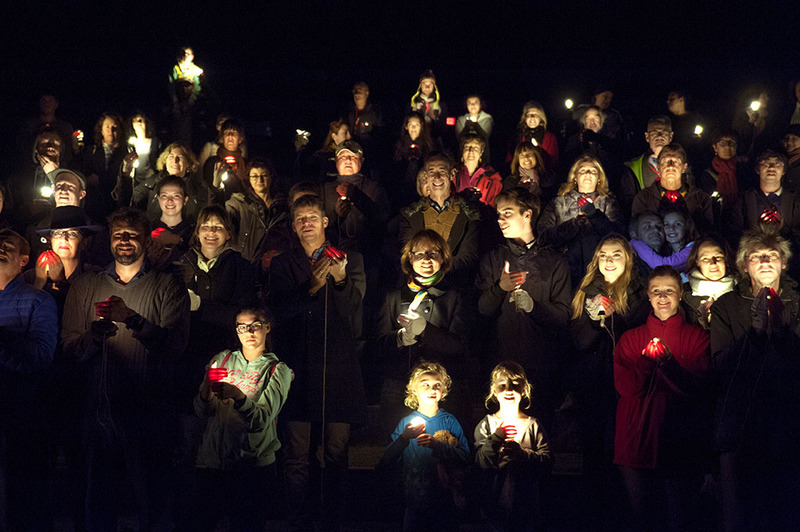 Finally I got everyone to stand for a group photo holding their lights up to their faces like candlelight. The mood in the crowd was wonderful. The whole event took less than an hour but it was really unforgettable. LPP ∇ This work is very different from the solitary act light painting tends to be, what inspired you to take this direction with your light painting work? PS ∇ Although my art practice as a light painter requires me to generally work alone, I have been moving away from just doing solitary acts of light painting and looking at ways to bring that ‘magic’ of light painting to new audiences, in areas such as public art performance, child education and art therapy. It is obvious to anyone reading this interview that light painting is an incredibly magical process. Through my experience as a workshop teacher I have seen how people respond to light painting and how universally appealing it is. From kids to the elderly, there is a joyful intrigue and sense of play when people are introduced to a light painting session. I really feel such positive outcomes should be explored more fully, hence I’ve been exploring participatory projects. 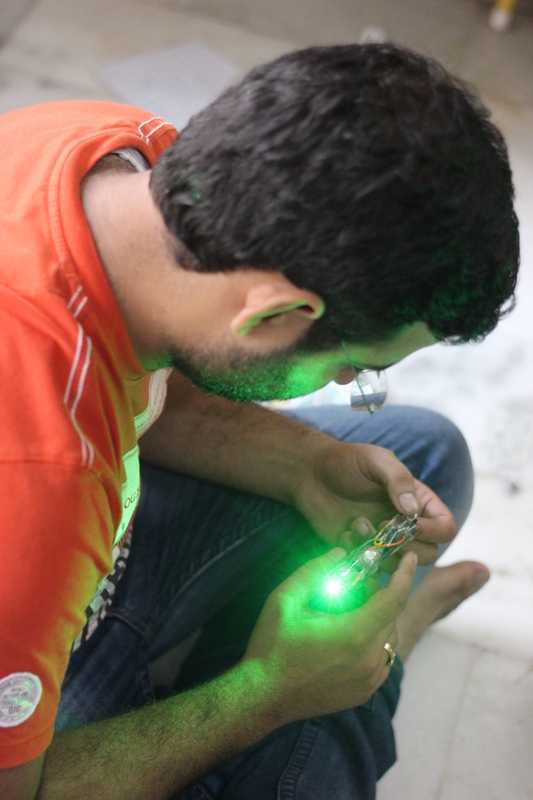 I have also started developing light painting workshops with disadvantaged people who are needing activities to improve their self-esteem and social engagement. Light painting can be a really powerful tool in showing people a different way of seeing themselves and the world around them. LPP ∇ Absolutely, can you tell me more a little more about these workshops and how the idea was sparked? PS ∇ I have an 8-year-old son and when you are around kids you get to see how much pleasure they get out of playing with lights. I have been thinking for a while about how to use light painting in schools to develop imagination and creative expression. I did an event at a primary school (kids 5-11years old) annual art show recently. 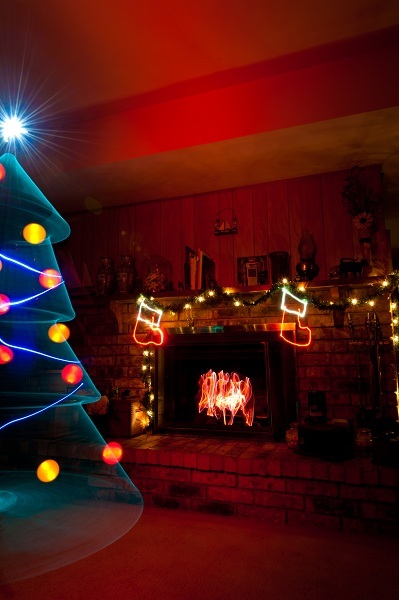 The good thing about it was that the kids love playing with lights but they didn’t really understand what the final image would look like. So it really blew them away when they saw what they had created. LPP ∇ Is it more difficult to work with the kids or is it more fun because of all the energy they must bring to the work? PS ∇ No doubt working with kids is much more chaotic. You just need to not expect too much and keep things simple. I’ve found it’s best just to let the kids have some fun and keep firing the shutter, as you are bound to get a few interesting images. The way the kids use their lights creates a unique expression of their chaotic youthful energy. LPP ∇ The images are just awesome, and it’s just so damn cool that you are inspiring so many people to try light painting. Thank you for the work you are doing and for taking the time to answer some questions! 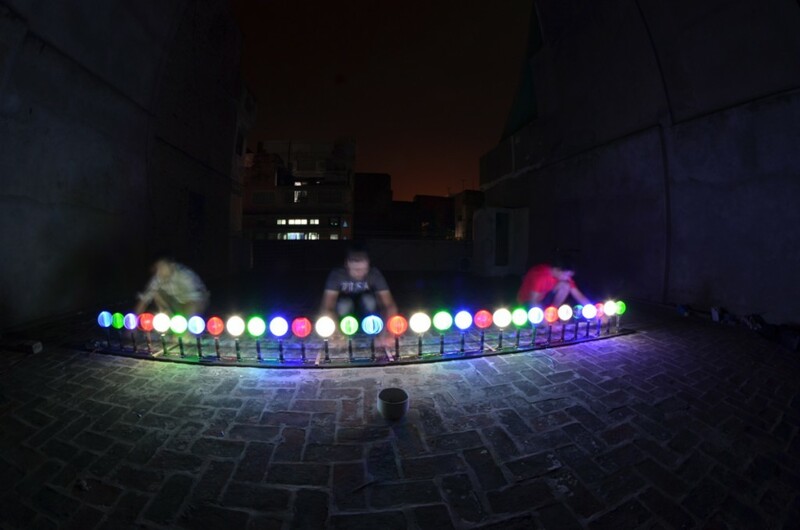 Congratulations to Light Painters Satwik Sharma, Ankur Bansal, Sanchit Kapur, Shobhit Tiwari, Jeswin Rebello and Arun Pandit for now holding the official Guinness World Record of 900 Light Painted Orbs in a single exposure as seen in the above image! 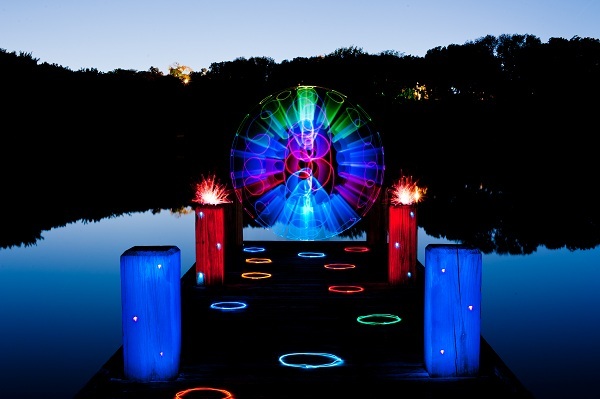 First let me give a little back story on the Light Painting Guinness World Record… The quest to get a Light Painting World Record all started back in 2011 with Andrew Wells when he single handily created 100 Orbs in a single image in his Century of Light Orbs Project. Andrew should have had the first ever Light Painting World record in the Guinness Book back in 2011 however he didn’t have all of the documentation that Guinness requires. Andrew might not have made the book because of technicality but he was the first. 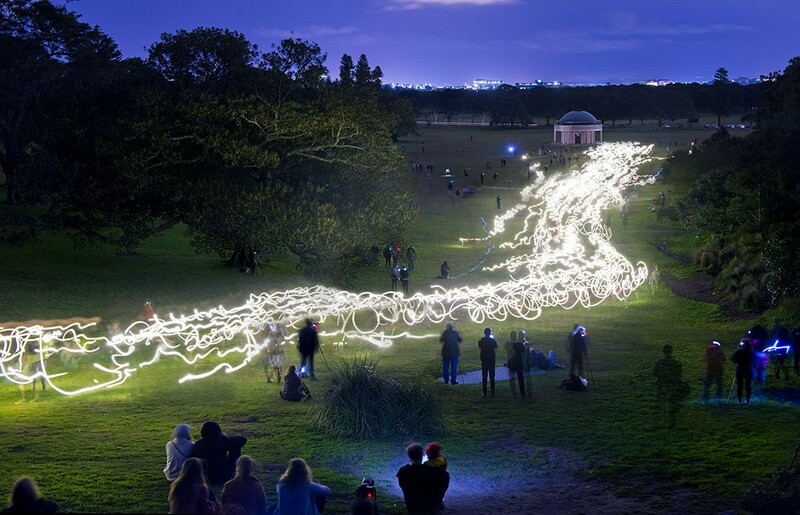 Then in 2014 a group of Light Painters (myself included) set out to break Andrew’s record and to “officially” get the first Light Painting Guinness World Record in The Big Book! 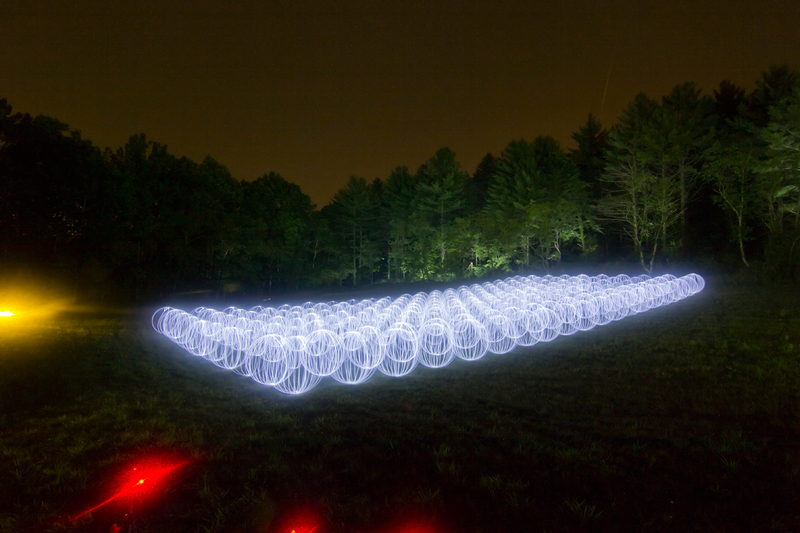 Together the East Coast Light Painters created 200 Orbs in a single image. 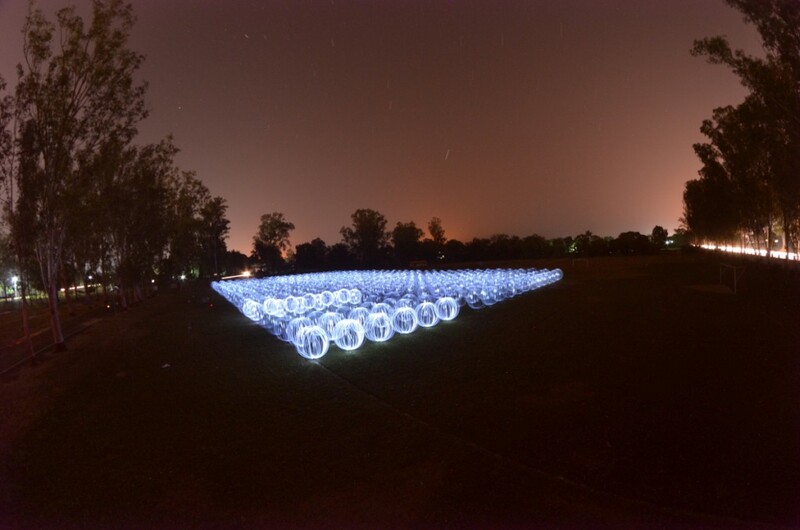 Now the record has been shattered with 900 Orbs in a single image from a group of 6 Light Painters from India! 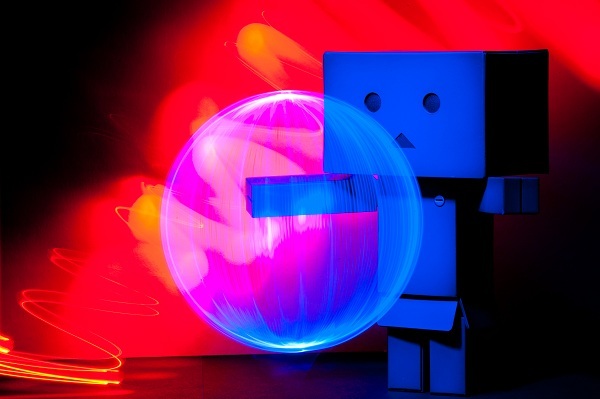 The Indian Light Painters created 900 orbs in a single exposure using a very smart approach and some good old DIY Light Painting innovation, read on for all the details from group member Dr. Satwik Sharma! 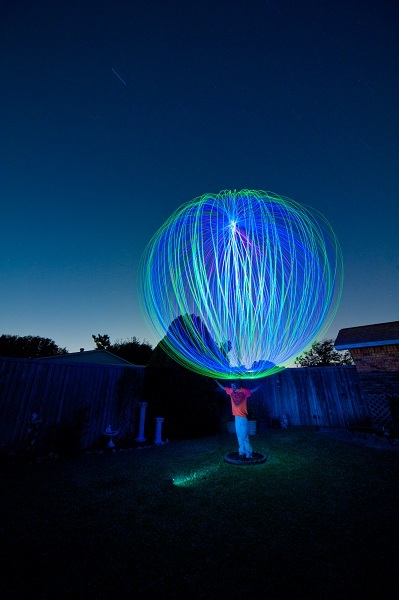 LPP ∇ Congratulation on being the new Guinness World Record holder for the most Light Painted Orb in a Single Photograph! Can you tell me who all were involved in creating the record? LPP ∇ How many orbs did you create in the record breaking image? SS ∇ In the record breaking image we made 900 orbs. 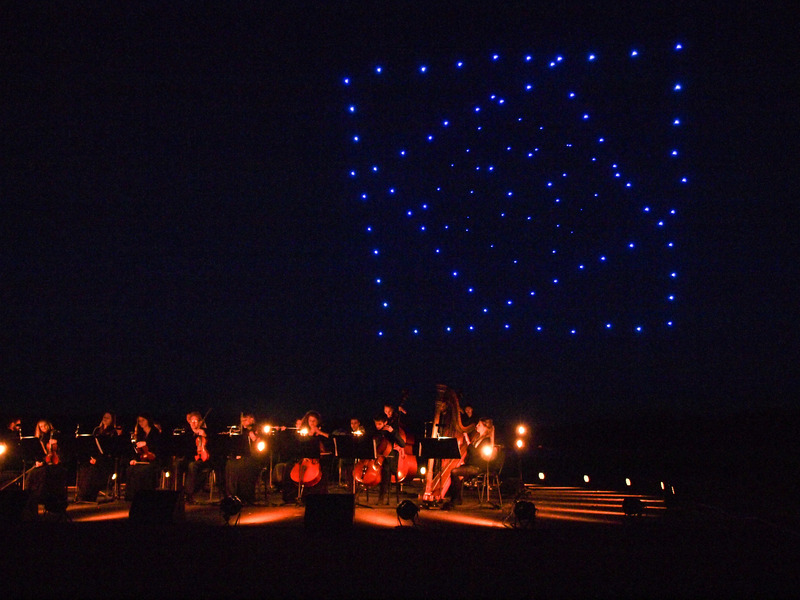 Though we did create a second image that day, and in that we made about 1450 orbs. But sadly, both the cameras recording the video, were interrupted mid-way, so we couldnt submit the footage from it to Guinness. LPP ∇ How many attempts did it take? SS ∇ This was our second attempt. In our first attempt we managed close to 600 orbs (594 to be precise). But me, along with a couple of team mates, were not satisfied with the pictures we got. So thought of making the attempt again. And with a new attempt, the target number of orbs was also increased to a minimum of 900. In our second attempt we did a trial run first, and made 210 orbs in that trial run. Adjusting the exposure we made the final run, and succeeded in making 900 orbs. In the second attempt the number was raised to 1500. Sadly, the batteries started to run out, by the end of the second attempt bringing down the number of orbs to about 1450. So we abandoned the third attempt. LPP ∇ I know that you had tried to break the record once before in a different way. Can you tell me about that experience? SS ∇ To be frankly speaking, our first attempt was heavily influenced by the ideas of the East Coast Light Painters World Record. So we tried replicating those tools, and those methods. And thankfully, we had the help of my Alma Mater, Sainik School, Kunjpura. We gave a crash course of light painting and making orbs to about 100 students over there (or as much as we can teach in an hour). After dinner, we had them gathered at the school grounds, and we did our attempt. The most amazing thing about this failed (partially) attempt was the enthusiasm and energy of the students. They seemed to be even more eager to break the record than we were. I still remember what one of them said to me after the attempt “Bro, This was an awesome experience! Why don’t you come back in couple of months with more preparation, and we will make a record of 2000 orbs” It still gives me the goosebumps. That was the level of enthusiasm I saw in the eyes of the students. And it is something, I would love to see again and again. 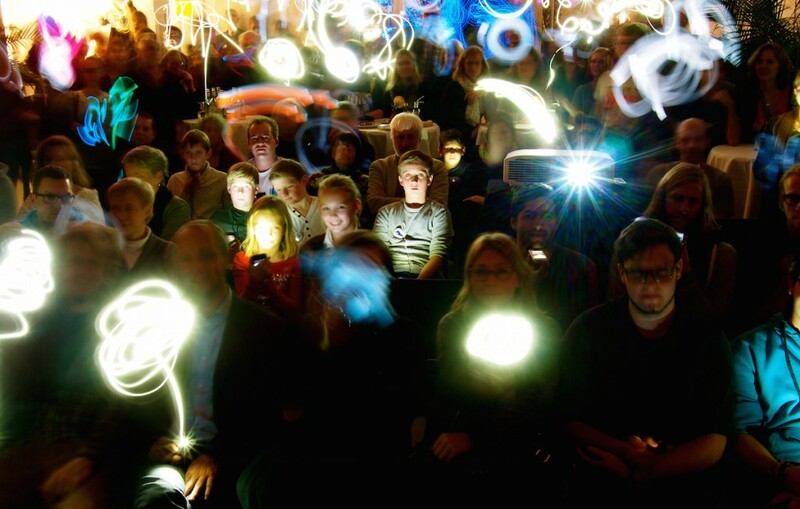 To teach them the joys of waving lights in the dark, and see those lights magically form Art. LPP ∇ Thats really cool I would say that was a success just for the experience! The idea of making the orbs smaller was a really smart way to go about breaking the record how was the idea of making the miniature light orbs introduced? SS ∇ After that attempt, we started analysing the shortcomings. Where did we go wrong, and how can we improve upon them. One thing was sure, the way we had gone about with the first attempt, that way was good for only about 300-400 orbs. Because as the number or orbs start to increase, the orbs at the back start to become less distinguishable from the nearby orbs. As I was adamant on creating a minimum of 500 orbs, we needed an elevated platform of about 150 feet to overlook a big flat surface, to get the proper angle. But, as we could not find any place like that, we moved to the next logical choice. Decrease the size of the orbs. The radical idea of reducing the size of the orbs was proposed by Ankur Bansal, and it was readily accepted by the group. But, as we had never seen a tool which would create miniaturized orbs, let alone create more than 500, it presented a new set of problems. So after brainstorming for a couple of days, we came up with the design of the tool, and started working on it. LPP ∇ Can you tell me a little more about the tool you guys built, it looks like a piece of DIY Light Painting genius… was it computer controlled, hand controlled, or a bit of both? SS ∇ From the outset, we had planned to make the attempts with as much frugal resources as we can. For the two attempts we made, our total expenditure did not cross the $200 mark (excluding the air tickets, ofcourse). 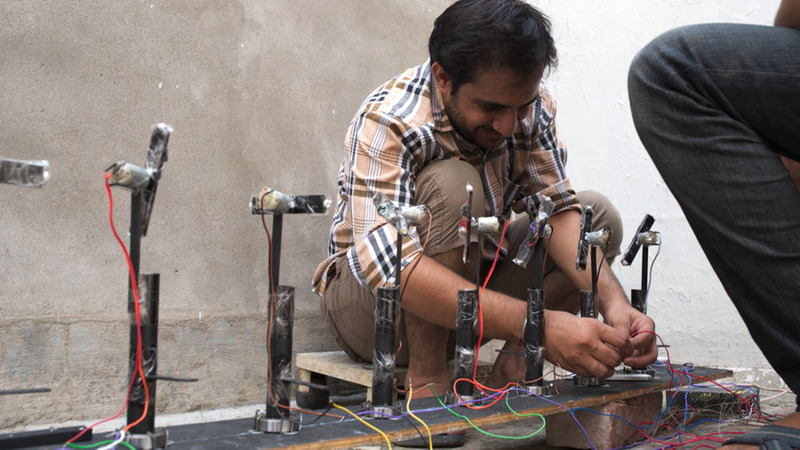 With such a shoe-string budget, using a computer controlled tool, was out of question. Also, it was out of the area of our expertise too. 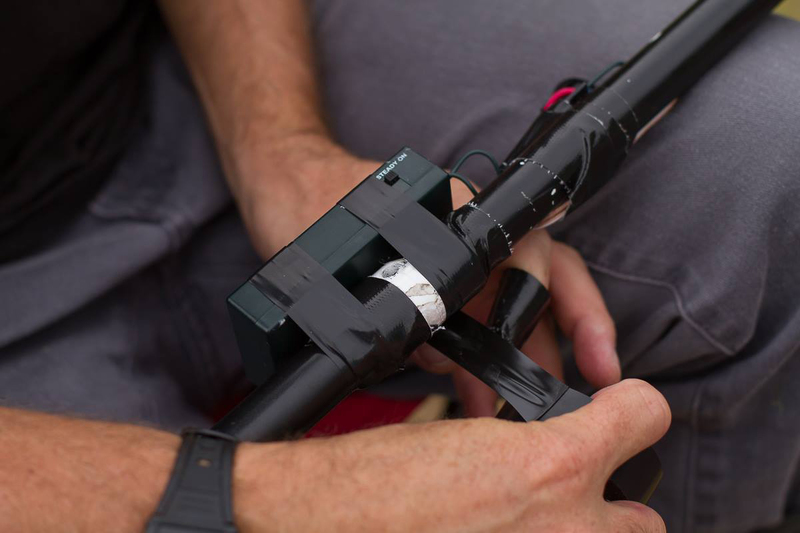 Our tool was made of wood, PVC, and simple DC motors. And was controlled manually only. LPP ∇ So who did what in the group, how many people did it take to operate the orb tool and how long did each orb take to make? SS ∇ Out of the six of us, Me, Shobhit and Jeswin, were handling the cameras. I was on the highest perch, while Jeswin was on the other platform. Shobhit was on the ground, clicking pics and making video for use in the video presentation. 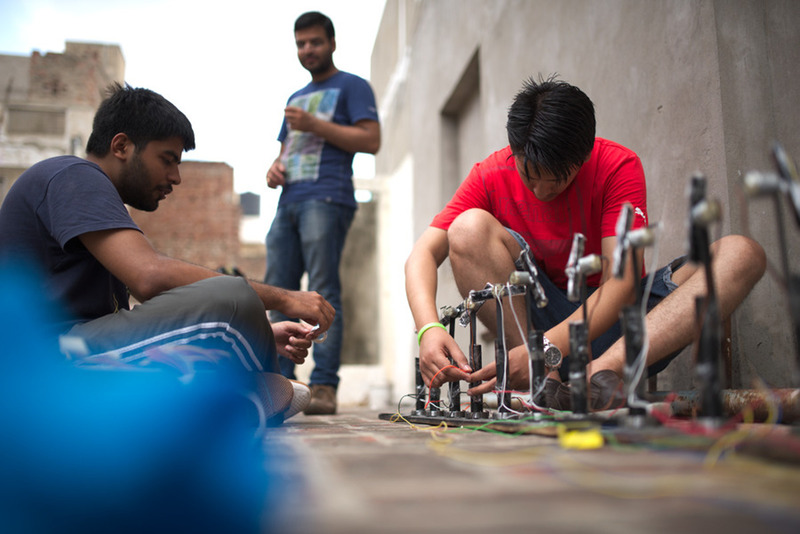 Ankur, Sanchit and Arun were involved in manually making the orbs and moving the tool in unison. The tool made 30 orbs at a time, in about 30 secs. It also needed to be moved to the next marked location, after making a row of orbs. We made a total of 30 rows of light orbs. LPP ∇ What was the most difficult part of the process? SS ∇ The most difficult part of the process was the complete lack of knowledge on how to go about it. 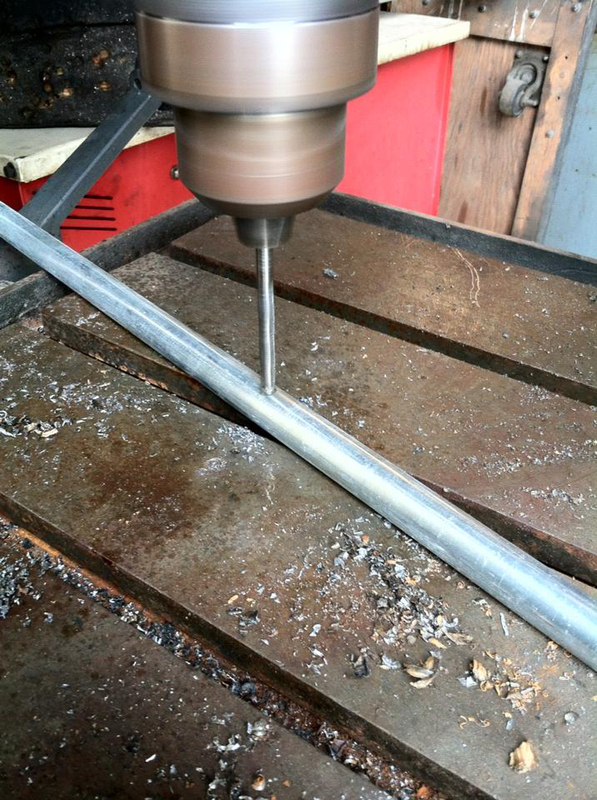 We would create one tool, build it up from scratch, test it, and after finding one fault or the other, junk it. 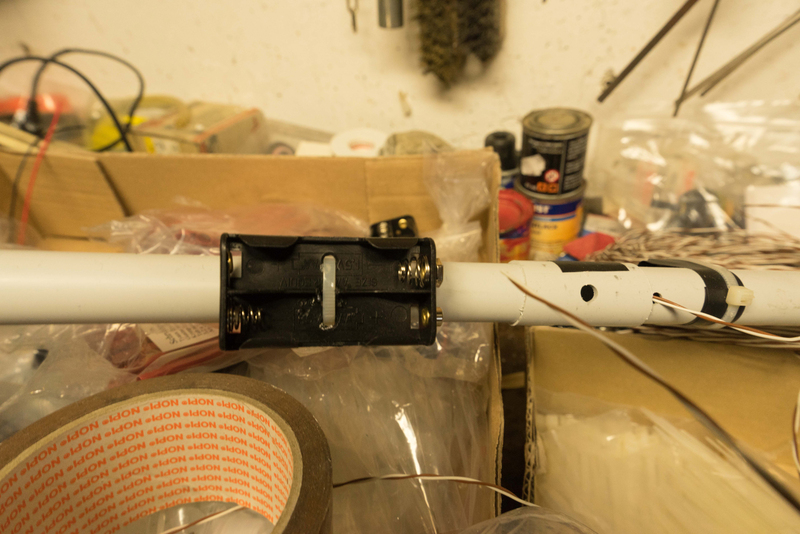 Also wiring up the whole tool was a mess. DC motors we got our hands on were not standardised. One would run faster than the other, the other would be slower. It was a complete nightmare. And above all, we had no mechanism whatsoever to control the speed. 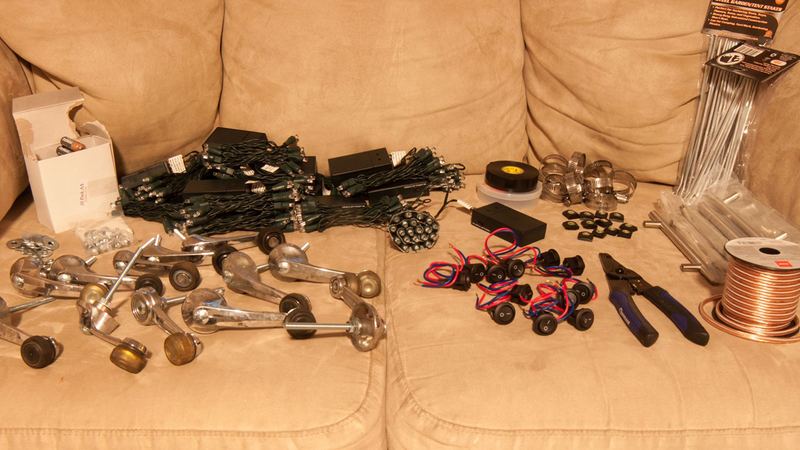 So it was just a game of mix and match, trying all sorts of combinations to get the motors running at optimal speeds. On top of that we made the mistake of using aluminium core wires. 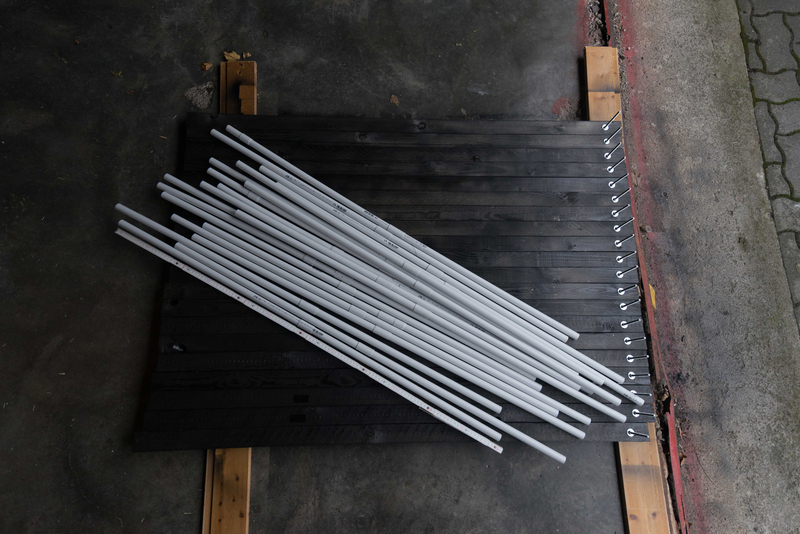 Aluminium having higher resistance than copper, would make the matters even worse. The current and voltages just seemed to vary at every single point. LPP ∇ I know you needed to have a high angle to capture all the orbs how was the location selected? SS ∇ By the time we started looking for a location for our second attempt, we had decided on miniaturizing the orbs. So we just needed a flat surface with some kind of platform with a minimum height of 25 feet. We found a flat ground, with double-storey houses on three sides giving us a height of about 35 feet on one side and about 20 feet on the other. That was sufficient for our attempt, and few test pictures from these vantage points just proved it. LPP ∇ How long was the exposure for the final image? SS ∇ The exposure of the final image was 830 seconds. LPP ∇ What was the best part of the experience? 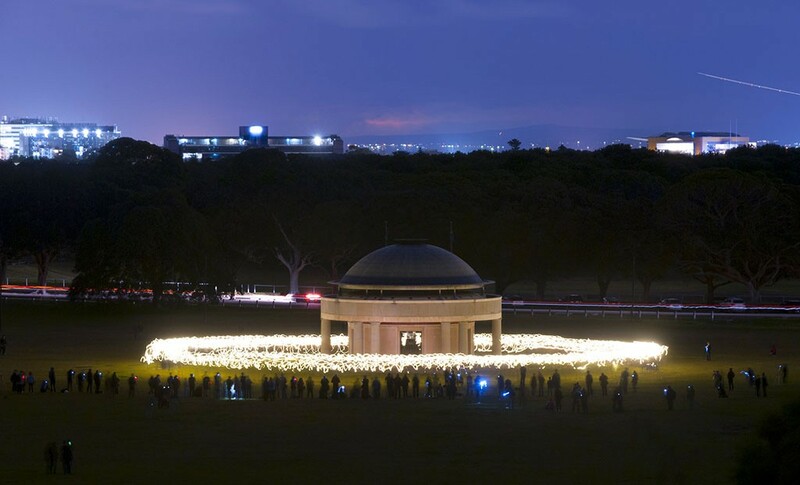 P.S The East Coast Light Painters Still Hold the First Light Painting Guinness World Record. HA HA. LPP ∇ Hey Tim Congratulations on your big win at the Trierenberg Super Circuit! It so great to see a Light Painter getting recognized at such a large event. Can you tell me a little more about yourself and how you got into Light Painting. TR ∇ I have owned a dslr since 2008, until I got hooked up upon Light Painting I shot the usual, regular stuff most likely every beginner in photography shoots – plants, family (kids), all sorts of animals and insects, and so on ;-). After I paused from worklife because of a burn out and depression I tried to do photography a little more seriously and that was the time I stumpled over the works of Jan Leonardo Wöllert and other light painters. I just wondered “how the hell do they do that! A little later I had my first attempts with whoolspins after some tries and some fails, voila I had my first whoolie orbs done, that actually had a proper shape. Lots of experiments with different led lights followed. 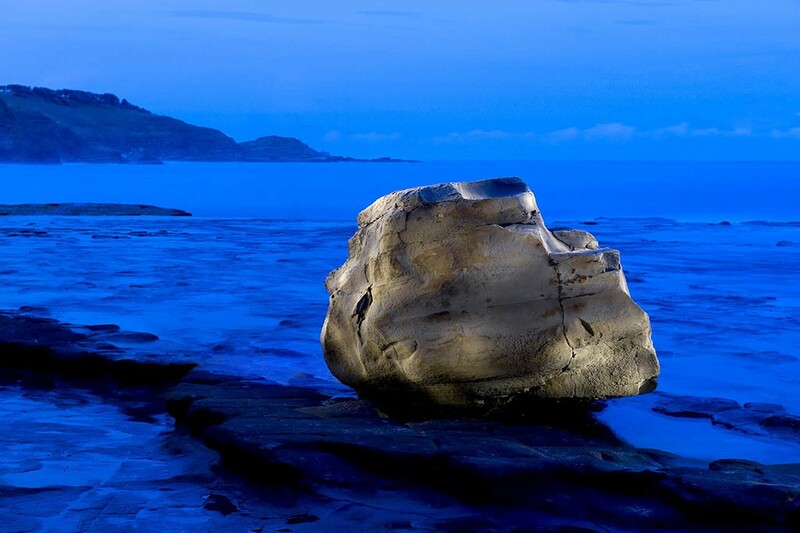 But it was not enough – I generally wanted to get deeper into photography. The best thing to do seemed to me to join in a local photo club. As it turned out later, I picked one of the most successful clubs in germany. None of my clubmates had any expierence with Light Painting before and they were a bit skeptical about the images I showed them. 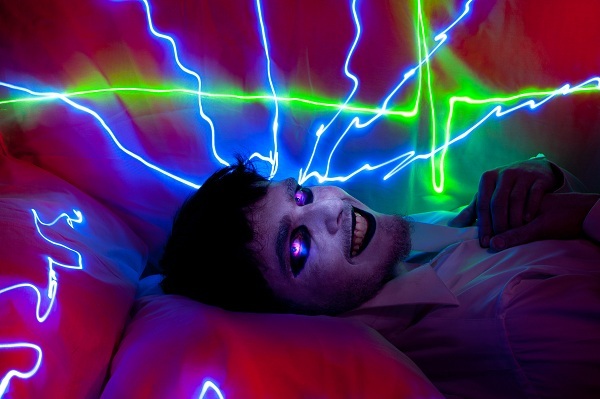 In Dec. 2013 I got lucky and one of my images were picked for the LPWA Exhibition in Paris – I guess it was from that moment, people at the club took Light Painting a bit more serious. LPP ∇ How did you become involved in the contest, did you find out about it through the club? TR ∇ On regular club meetings there is much discussion about pictures and wether they would might work in contests, on that occassion I first heard about huge contests like “Al Thani”, “Hipa” and of course “Trierenberg Super Circuit”. Some of my clubmates seem to believe in the stuff I did and in early 2014 they convinced me to join a contest called German International Photo Cup, compared to Trierenberg it is a rather small one. I didn’t expect any of my Pictures to be good enough to actually compete but one of them got me my first gold medal and I was hooked. I submitted pictures to other contest and got at least several images accepted and at “Hipa” one of my images even made it to the last judging round. You got to know, we’re talking about contests that are mostly about classic photography themes like Portrait, Landscape, Architecture, Nature. Trierenberg however is a bit different, the people behind it are looking for images a bit more artistic than in other contests. That (besides beeing curious) was the main reason I sent in 14 images. The Contest is split into several, so called salons with categories like night photography, nature, nudes, portrait, digital art and so on… That got me a total of 30 acceptances, which alone is a huge honor in such a big contest. 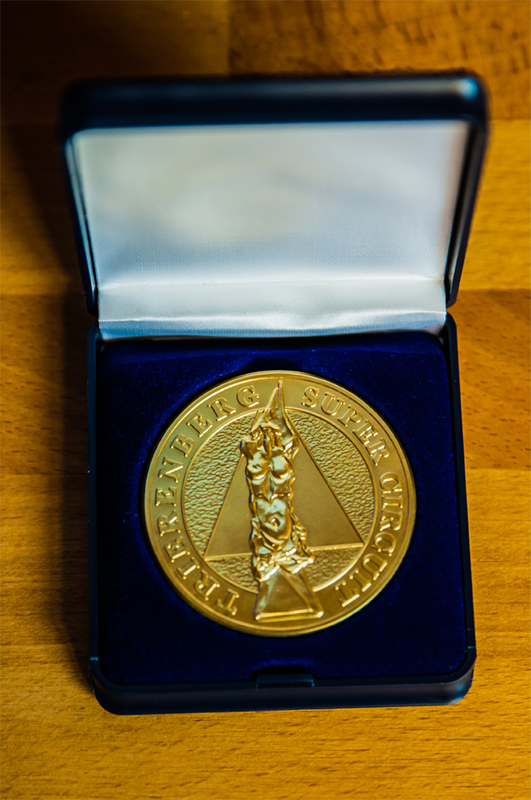 There was a total of 110,000 pictures from 110 countries that were submitted, which makes trierenberg truly the world biggest contest – one reason it is often refered to be the oscar of photography! LPP ∇ Did you make the image specifically for this contest? TR ∇ Actually no! After the exhibition in paris I got a call from a local TV station – they asked me about an interview and I created this image for that occasion. LPP ∇ How did you find out you won? TR ∇ At the end of the judging phase every particpant gets a notification via e-mail, which tells which picture got accepted. I however got an e-mail wich said I was one of the winners – awarded with the gold medal in the category “Nightlight and artificial light”! 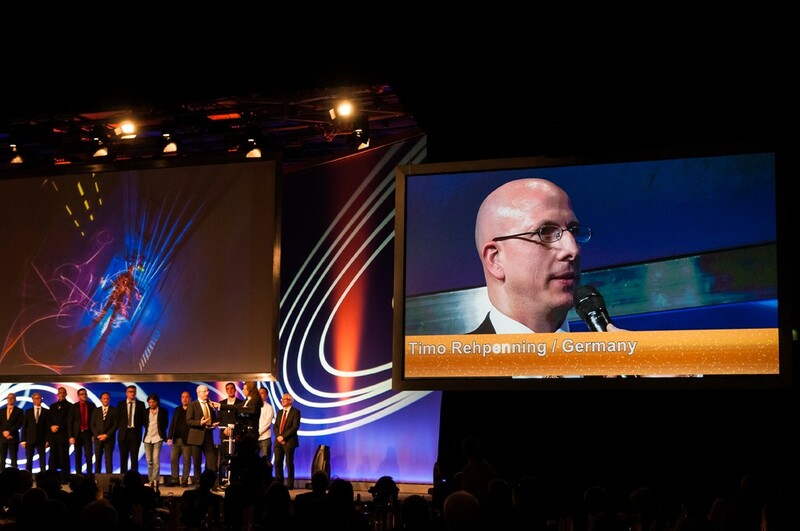 I was invited to the gala of photography in Linz. Don’t ask how many times I had to read that email until I finally realized I wasn’t dreaming! LPP ∇ What did you win? TR ∇ Loads of money? “laughing” Well no, I got a nice metal, that looks great in my display cabinet. Only the winners of the “Grand prize” get some cash, but for that you have to have your pictures ranked at the top in all salons and different categories as well. I didn’t drive all the way to linz (from the place I live its about 650 km by car) only to get this medal, it was an awesome event and I had the chance to see really great pictures in each category, meet some fantastic people (and all of them crazy about photography, and many traveled half around the globe to join the gala – some of them came all the way from China and Australia) I made some new contacts. The way I see it – The gold medal I just got is not only a medal for me, its for all Light Painters, the ones that got me into this kind of Art, the ones that pushed me and it is also for Dennis Calvert (thanks once more, mate!!) who developed the technique I used to create my winning picture. LPP ∇ Congratulations again its a awesome image and a win for all of us, and thank you for taking the time to answer some questions! LPP ∇ Check out more of Tim’s work on his website and Facebook! Ulrich Tausend a.k.a. 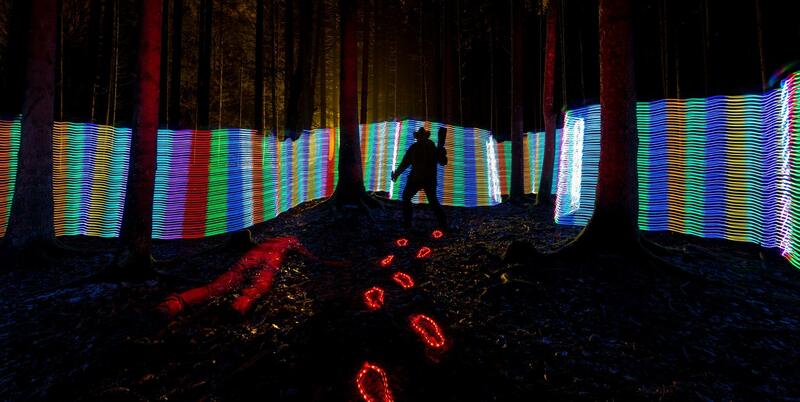 1000Lights Record Breaking Light Painting! LPP ∇ Uli, Congratulations on your wonderful work sharing light painting and your dedication to setting a light painting world record. 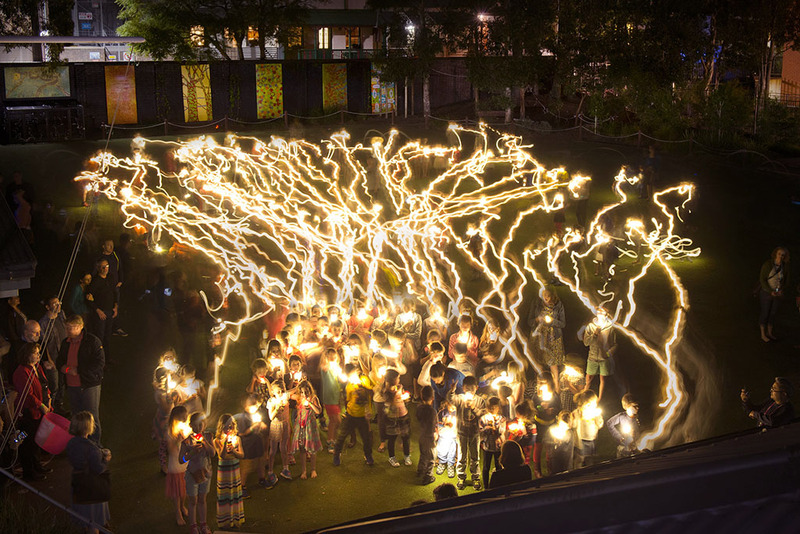 Seeing all those people light painting together is really something special! Can you tell me a little more about yourself? UT ∇ Lighting has always been an important topic in my photography. 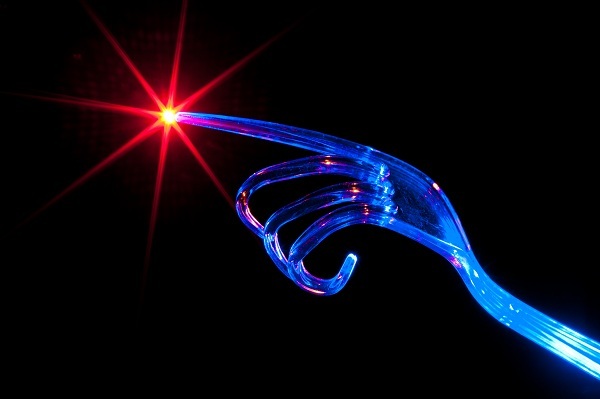 I started with Light Painting some years ago and I really like to explore what I can do with this Art Form. While it is fun to do orbs and ufos and so on, I prefer to work with people. 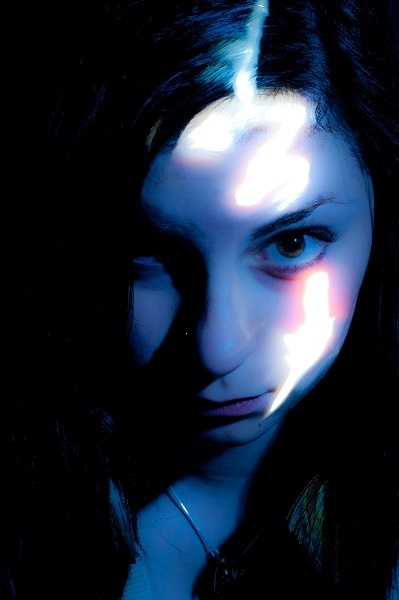 Most of my light paintings involve people in one way or the other. I like interaction, especially with newbies who don’t know about light painting yet and therefore often have really fresh ideas. 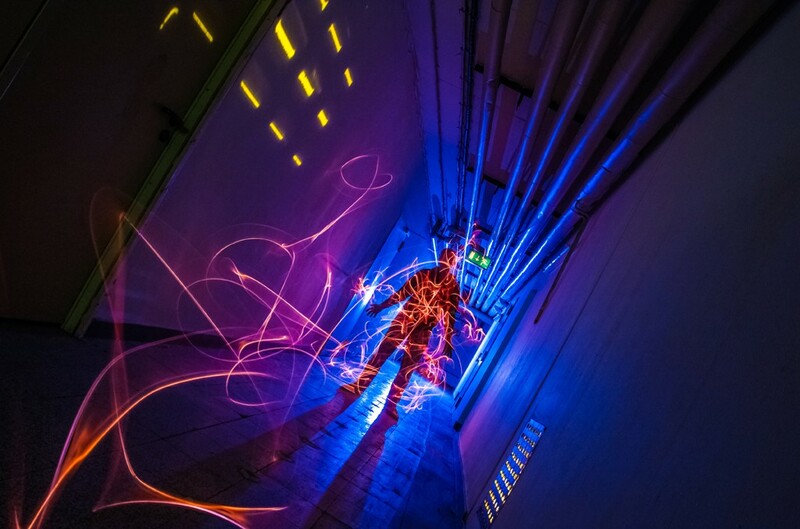 It is always exciting to see people experience the magic of light painting for the first time. I am also very involved with education, I love the sparkle in the eyes of students. For the last two years I have been working at the JFF – Institute for Media Research and Media Education in Munich/Germany. I have a history of game design and owned a computer games company before selling it in 2008. Since then I have focused on media education but I am still involved with serious game design. I am a Sociologist. 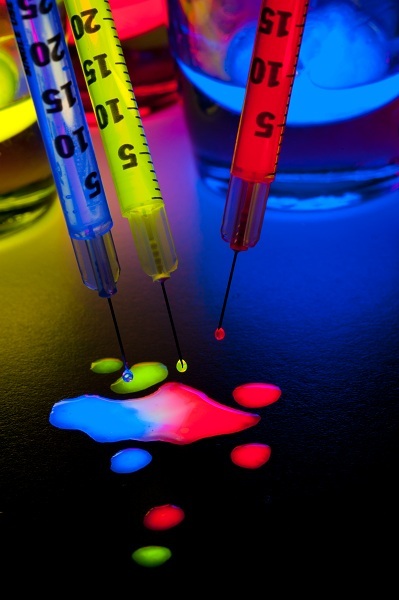 LPP ∇ Does the name of your website 1000Lights relate to your passion for sharing light painting and education or something else? UT ∇ My surname “Tausend” means “Thousand” in english. 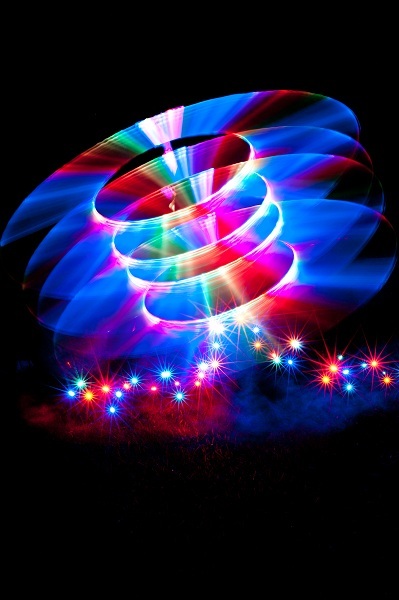 I use 1000lights as my light painting pseudonym. LPP ∇ Is this the first time you have created a Light Painting on a large scale with many participants, or have you done something like this before? UT ∇ Two years ago (2013) I organized the Kids Photo Award in Munich. There we first tried out creating an “audience light painting”. UT ∇ The kids really loved it. *See more about the Audience Light Painting 2013. 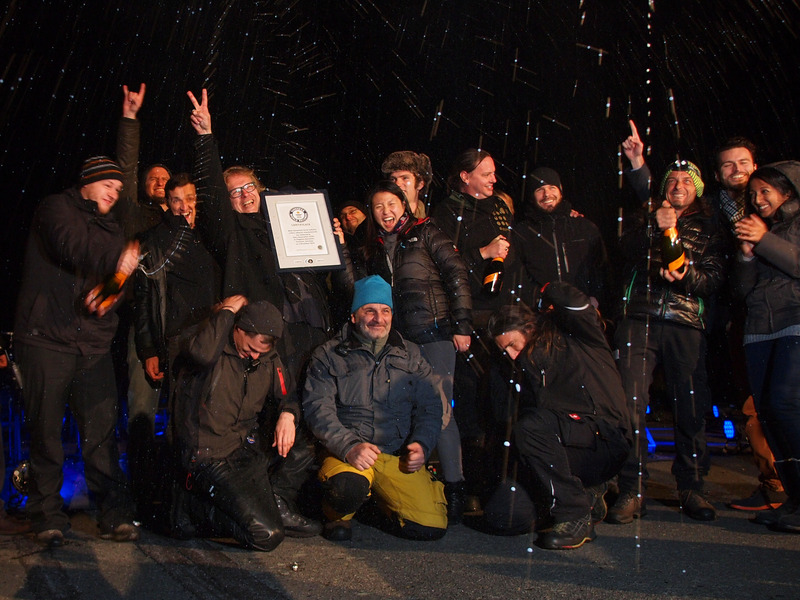 In 2014 we repeated the event on a larger scale trying to set an official world record. Making an official record involving many people actually posed to be a bit tricky. Guinness World Records only wrote us about what we actually had to do to get it accepted after the event and their guidelines are pretty tough if you don’t pay to get some one from Guinness involved. UT ∇ Since then I did several other “audience lightpaintings”. I especially liked the ones at the Ohrenblick Mal 2013 and and Mobile Clip Festival 2014. There we did something a bit more tricky. The people who won the award would freeze and put light on themselves with their smartphones. The others would add drawings. 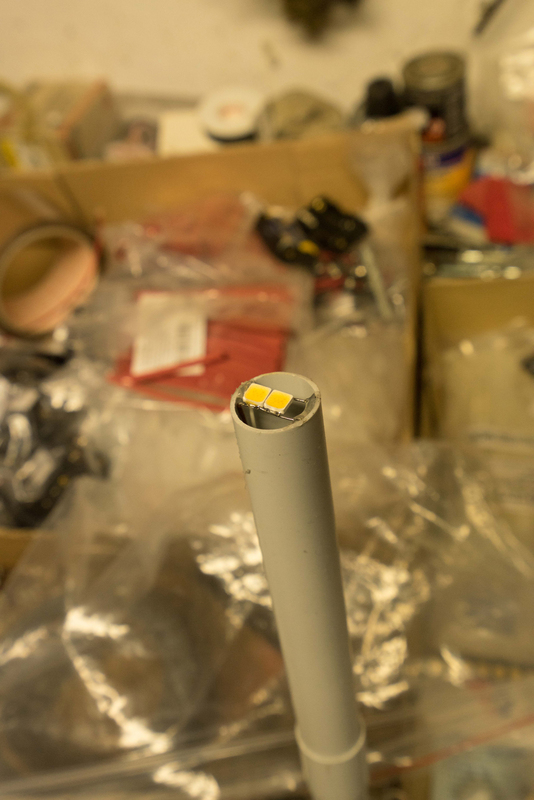 UT ∇ In 2014 we also had a Pixelstick to “print” the logo of the event. 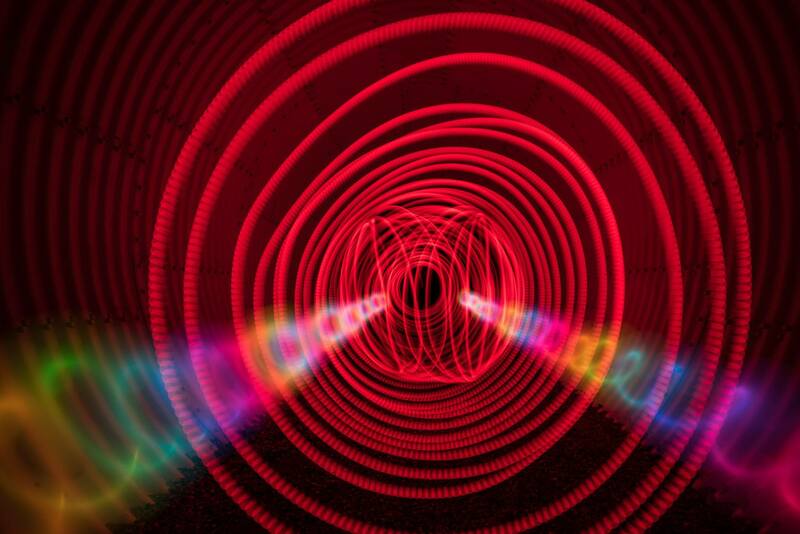 LPP ∇ What a great way to share Light Painting! Tell me about this most recent record attempt. Where was the event held, was it just to break the record or was this also part of some other event? 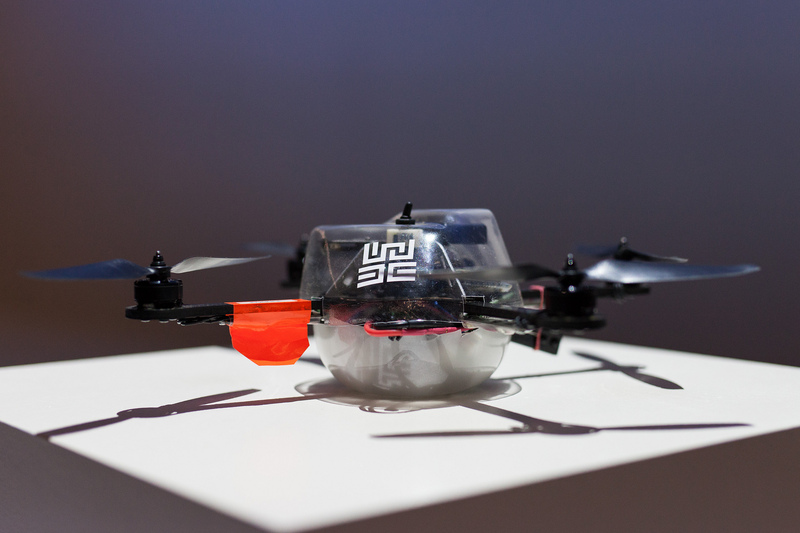 UT ∇ The world record took place at the re:publica conference about digital society. For the conference I handed in a proposal about new computer aided light painting techniques and I also proposed to set the record during the closing ceremony. Both proposals were declined. I also had another proposal for using Minecraft in Schools which was accepted so I went to the conference. The Minecraft session was pretty cool. We built our presentation in Minecraft itself which was a topic on the conference. I talked with one of the organizers of the conference (Jonny Hauesler) about it when the topic of light painting came up. He found it really interesting and asked me if we could still realize it. That was on the afternoon on 6.5.2015. At 22:00 he confirmed that they talked to the team and agreed to have the event during the massive closing ceremony on the next day! Incredible how flexible and open they are but that meant I had only couple of hours to prepare. During the night I planned everything. Back home in Munich I have a lot of equipment, but I was in Berlin with only a little light painting “travel” bag. In the morning I bought myself an extreme wide angle lens (Panasonic 7-14mm =14-28mm, f4) for my Olympus OMD EM-10. As I wanted the best possible setup I also borrowed a Nikon N800 with another 14mm extreme wide angle. That was actually not that easy as the company wanted a lot of money as security and there was only a little time to get it. 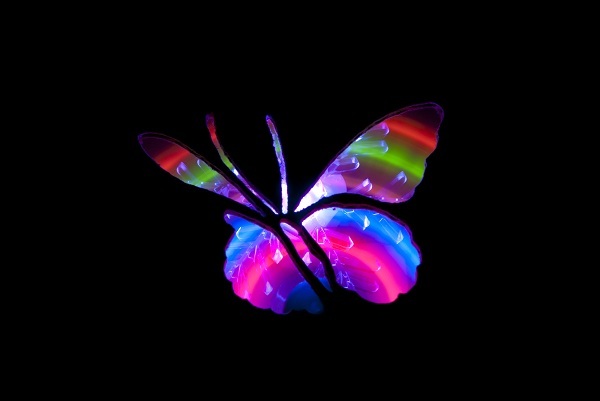 LPP ∇ Woah were you panicking or were you pretty calm because you had done audience light paintings before? UT ∇ It was a pretty intense situation, but I was not panicking. I had done similar photos before, only on a smaller scale. I was pretty well prepared (considering the short time frame). 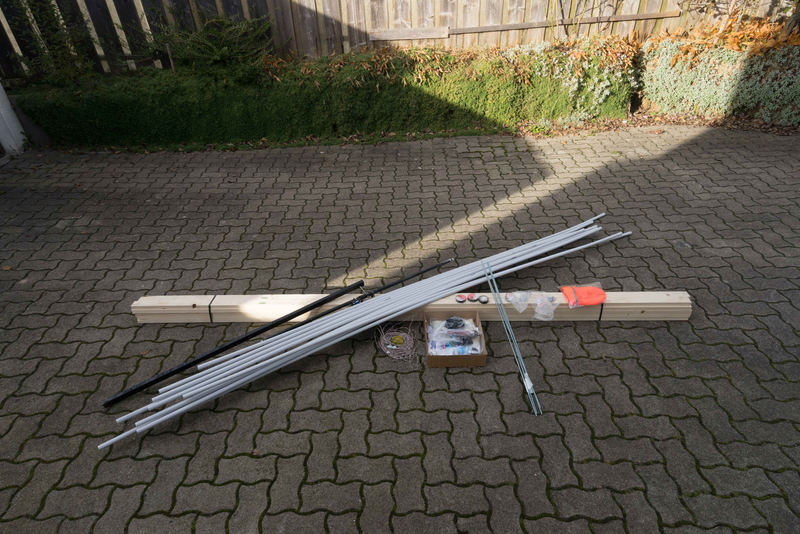 My colleague Maximilian Vilser (who controled the pixelstick) also helped a lot. Also Lilian Kura and her friends were really nice. She is a professional writer and checked over my tweets to announce the event and she and her friends really spread the word. To give you an insight into what we thought about, only an hour before the actual photo took place we stopped a plan to get the camera to a even more elevated position. We would have either used a high ladder or even a lifting ramp, but both possibilities seemed to be too unstable to get a steady shot. Also it would have lengthened the event and I was a bit worried to tumble from the ladder with 2500 people watching me. LPP ∇ Yes that would not have been good, lol. What about the lights for the participants, did you supply the lights or did they just use what they had available? UT ∇ As I was traveling and not expecting to do a world record attempt I only had 10 lights with me, several helping angels distributed these. But 98% of the lights present were smartphone-flashlights from the audience. With more time to prepare many more people would have taken their own colored lights with them or I could have provided more colored lights to add more texture. You can see my pixelstick on the back left side of the picture writing the tag of the event #rp15lights. We did not know how many people would be at the event, so we wanted to close a gap in the back. But directly before the event more and more people came in and it was really packed. So the Pixelstick is partially blocked by people. LPP ∇ How many people were actually involved in this image? UT ∇ From what I heard 2500 people fit into that stage as you can see the stage was full when the event took place. 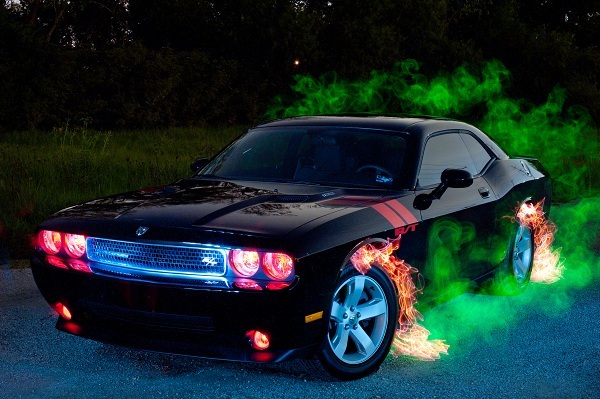 LPP ∇ WOW! How long was the set up, how did you explain the light painting process to all 2500 people, sometimes it is difficult to get 1 or 2 people to understand the Light Painting process. UT ∇ During the closing ceremony I briefly explained what everybody had to do (take lights and move them or try to draw something). There were two short pauses before the closing ceremony which I used to try out the camera set up and we were also able to dim the lights for a moment for one test photo. I also had someone help me and press the shutter on the second camera. LPP ∇ How long was the actual exposure for the image? Did you only have one take or several? LPP ∇ Obviously you were not able to have a Guinness Representative because of the very short notice so are you going to submit this to try and get the Official record? UT ∇ I am waiting for the video and some more photos from the front to try to hand in with them. 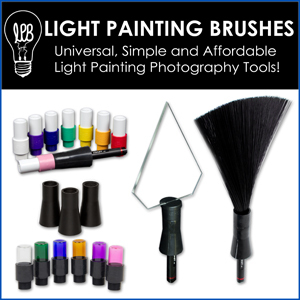 LPP ∇ I am sure I speak for all of the light painting community when I say WE HOPE YOU GET IT! One last question, what is it that drives you to share Light Painting in this way? UT ∇ It is a combination of many things: Getting to know light painting astonishes people, it often sets a creative spark in them and is a lot of fun. Spreading the word of Light Paiting is my little humble way to make the world a slightly better place. Just seeing how the people react, they love it. It is pretty cool to stand in front of a huge crowd all waving lights. But probably most important is that it fits in my own way of doing art. I like to bring people into situations where they have a feeling they never experienced before or do things they never thought of beforehand. In a way you could say that I like to manipulate people through art to discover and grow. Some will criticise events like this and question its artistic value. Instead of few doing professional light painting in a very planned and high quality way, it is many fresh minds trying it out without previous preconception of it. It is something unique which I think you can’t judge with usual quality standards which you apply to other light paintings. For me it is art nevertheless – or you could say it is art especially because of that difference. LPP ∇ Is there anything else you would like to add? UT ∇ The event itself was filmed but the video is not yet online. Several people filmed from within the audience. 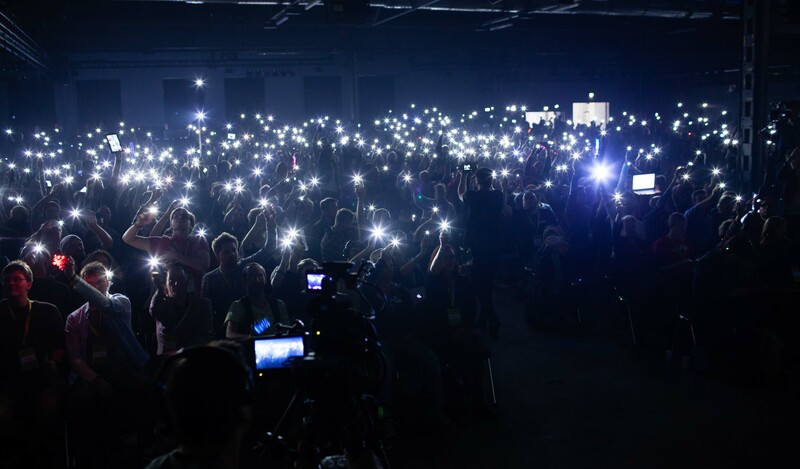 You can find some videos and other coverage on my page 1000lights.de/rp15. 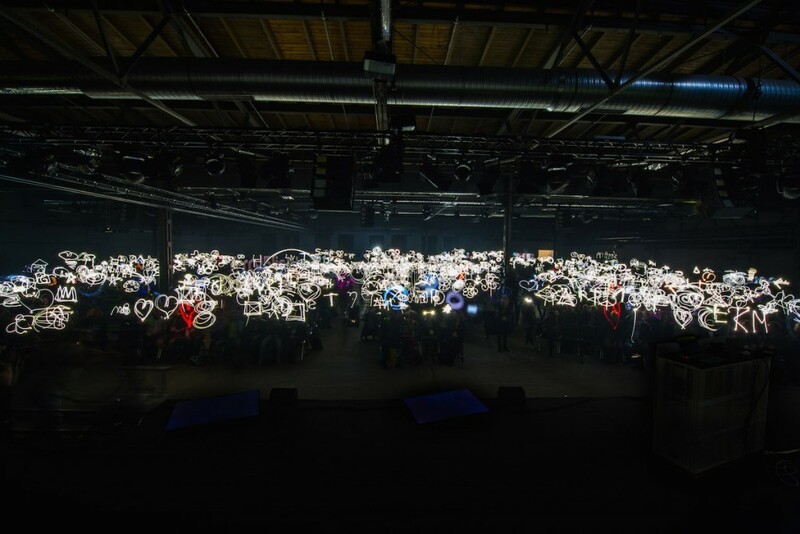 The tag of the event (#rp15lights) went trending (most tweeted) in Germany straight away. 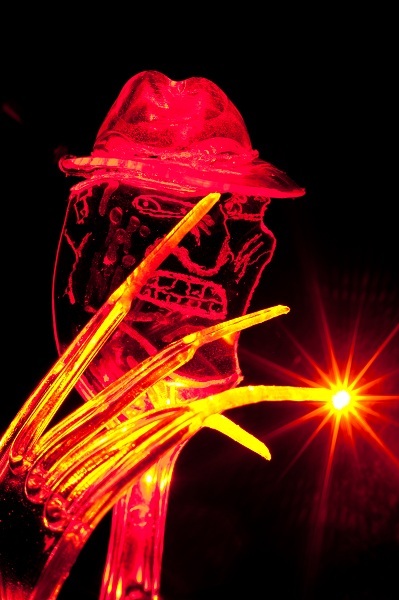 You can find more of my light painting pictures on 1000lights.de and my Facebook page. In addition to the “audience light paintings” I have some other light painting specialities: – Again I like to interact through light painting with people who don’t have experience with it yet. That especially works well, if the people can see how the photo is coming along, while they are shooting it. 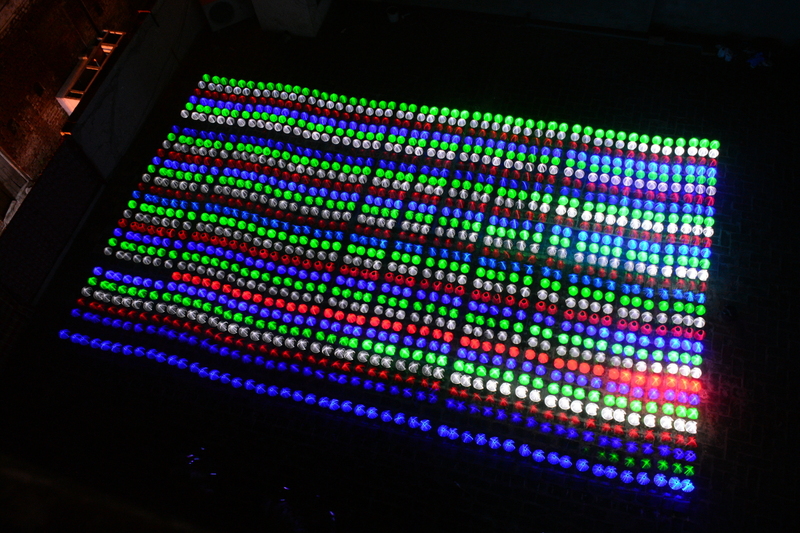 – I experiment with my pixel stick and other programmable lights. 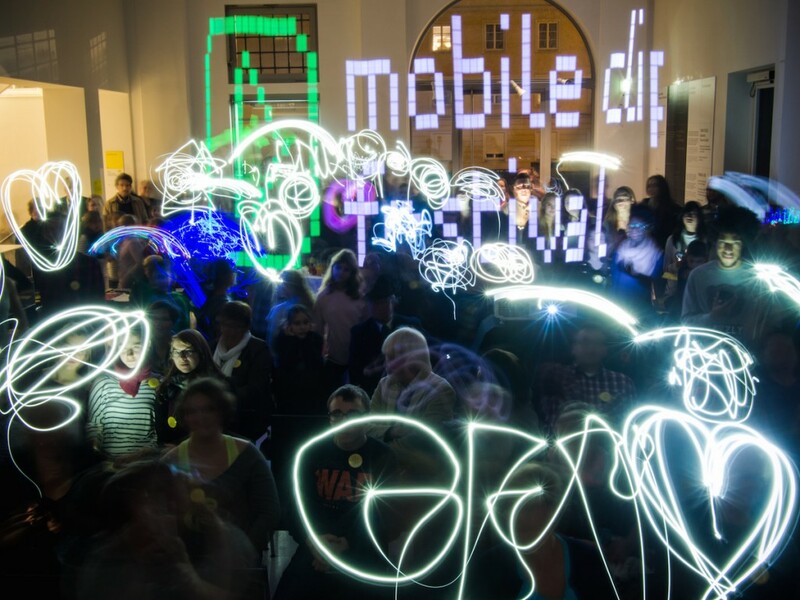 The QVED Conference and the Mobile Clip Festival 2014 are nice examples for that. I am also working on live light shows with a VJ. but we still a way to go there. LPP ∇ Thank you very much please keep up the incredible work! UT ∇ Thank you very much. 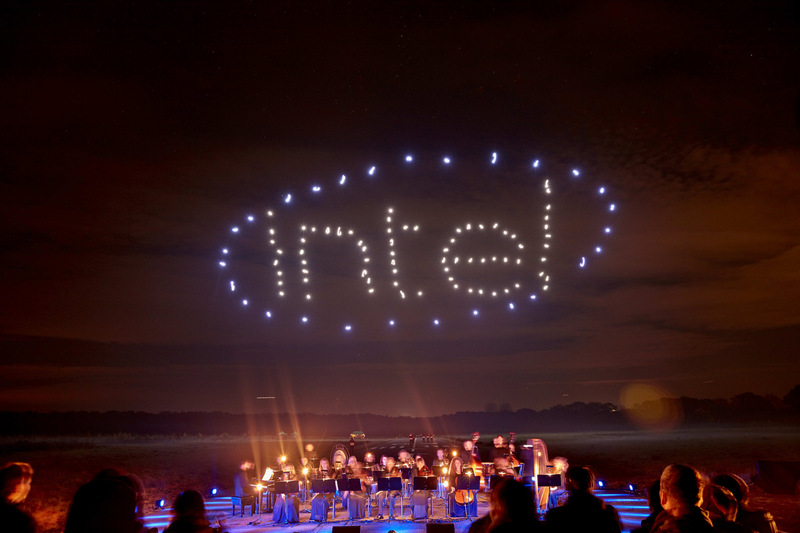 Here is a little teaser video from the event until we can bring you the full version.